The Textile Museum was established in 1925 by collector and connoisseur George Hewitt Myers to expand public knowledge and appreciation—locally, nationally, and internationally—of the artistic merits and cultural importance of the world's textiles through scholarship, exhibitions, and educational programs. 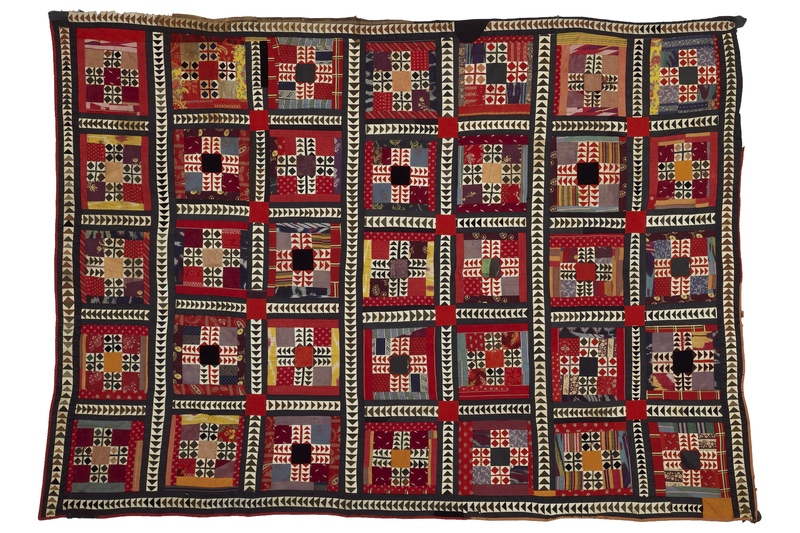 Today, its collections of more than 20,000 textiles and related objects represent five millennia and five continents, including cultures from the Middle East, Asia, Africa, and the indigenous peoples of the Americas. The 20,000-volume Arthur D. Jenkins Library of Textile Arts is one of the world’s foremost resources for the study of textiles. 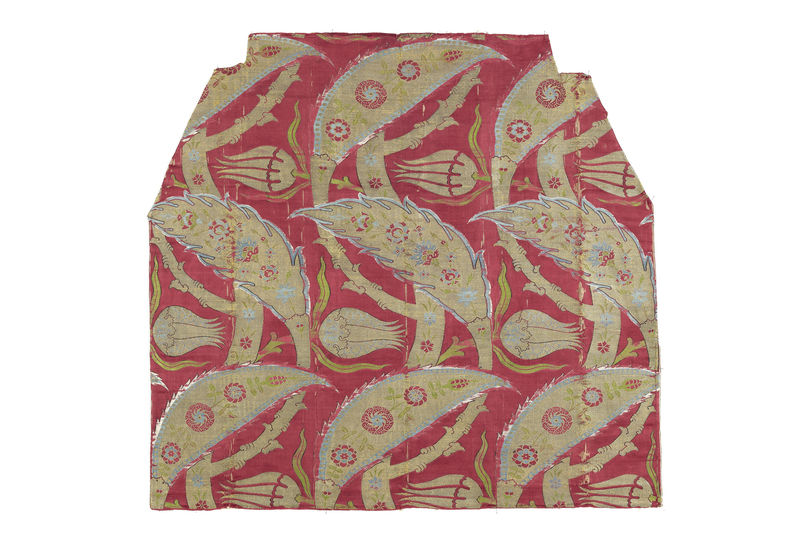 Scroll through the galleries below to learn more about The Textile Museum collections. 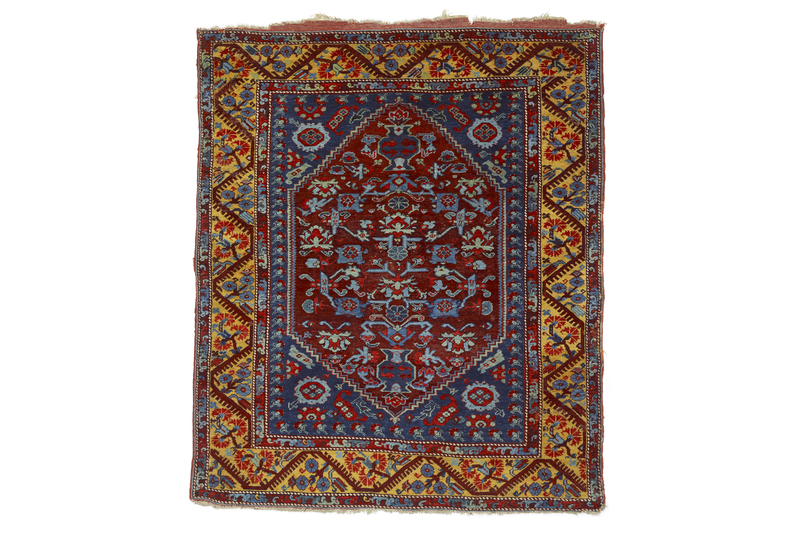 The Textile Museum has one of the most important research collections of Oriental carpets, distinguished by both its range and depth. 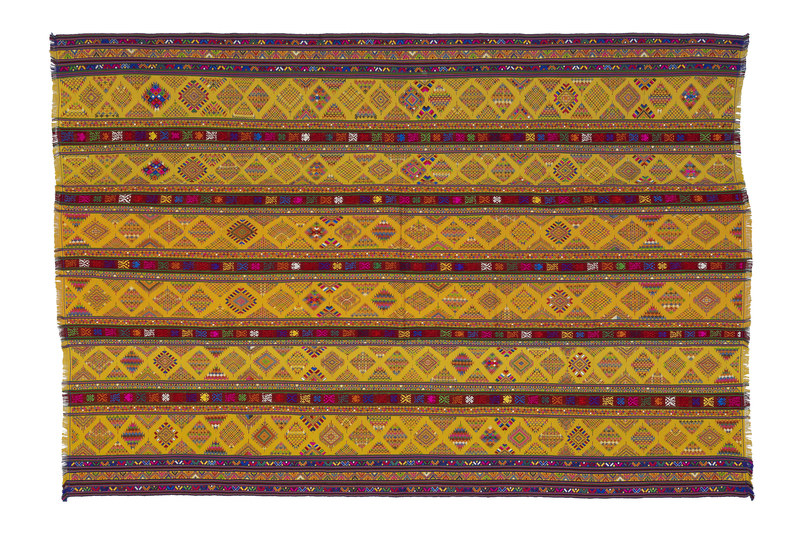 The Textile Museum has one of the world's best collections of pre-Hispanic Peruvian textiles, as well as extensive holdings of modern textiles that descend from these traditions. 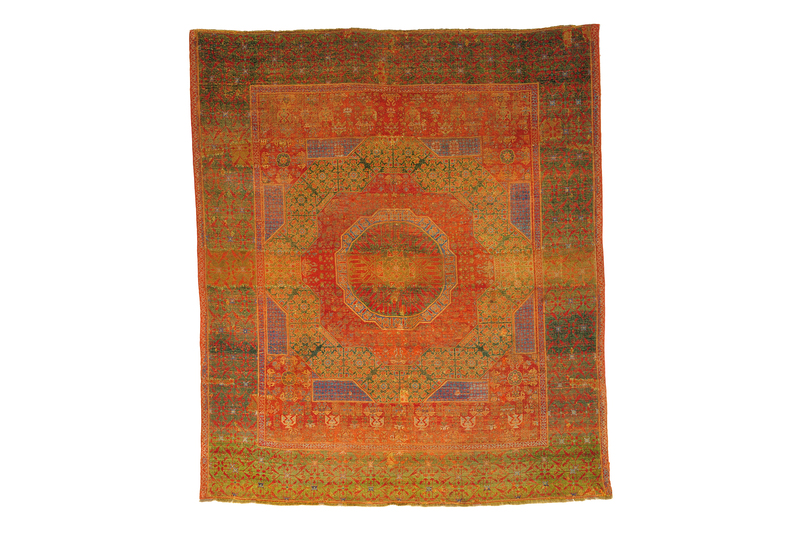 The Textile Museum has outstanding late-antique textiles, and its collections of eighth- to thirteenth-century Islamic textiles are among the world's finest. 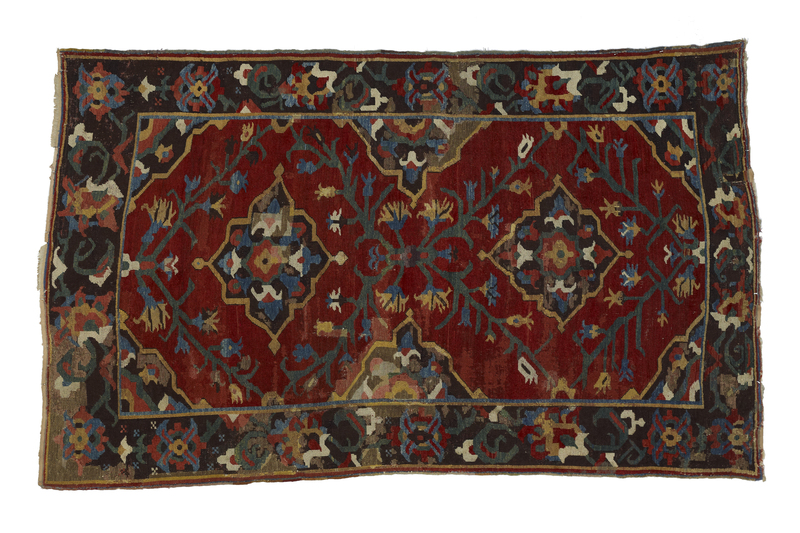 Highlights from this region include fourteenth- to nineteenth-century silk masterpieces from Spain and the Ottoman, Safavid/Qajar, and Mughal empires, and one of North America's largest ikat collections. 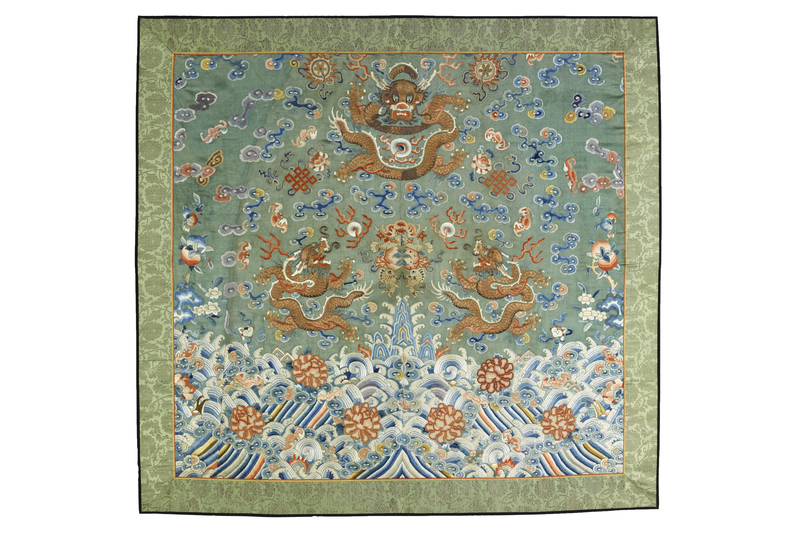 The Textile Museum's Asian collections feature more than seven hundred Chinese textiles that date from the third to the twentieth century. 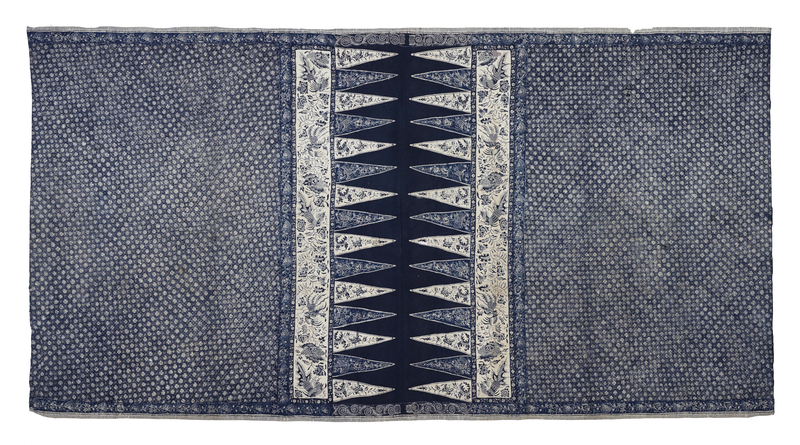 Highlights from Southeast Asia include some of the finest Iban textiles in the U.S. 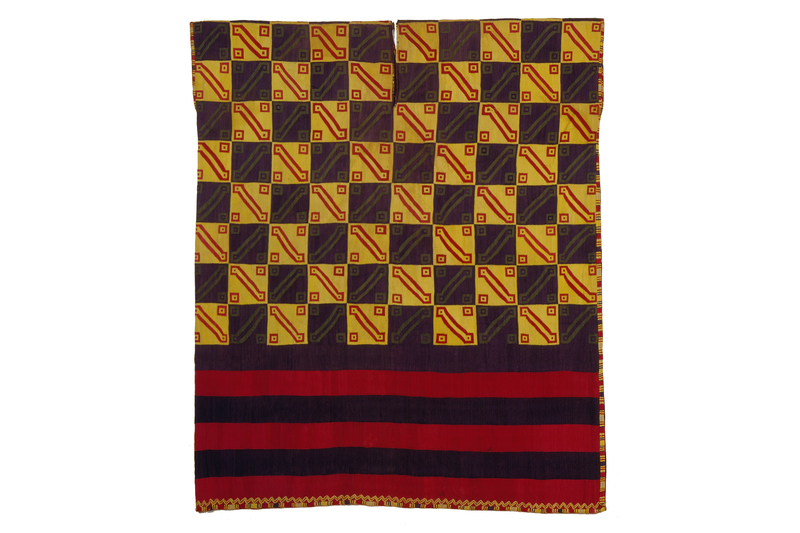 The Textile Museum has a large collection of African textiles representing diverse textile traditions. 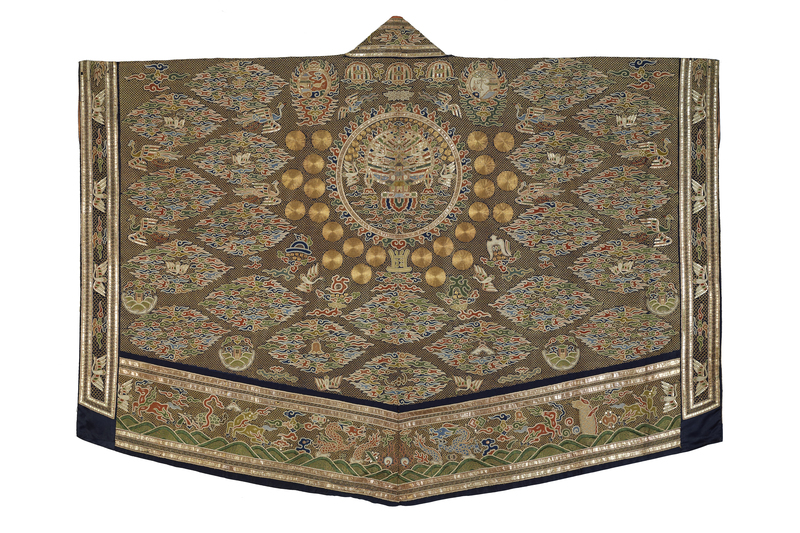 Fragment of a hanging or cover, China, mid-19th century. Silk, peacock feathers, metallic wrapped yarn, 25 x 19 cm. Acquired by George Hewitt Myers in 1940. The Textile Museum 51.30. Photo by Renee Comet. 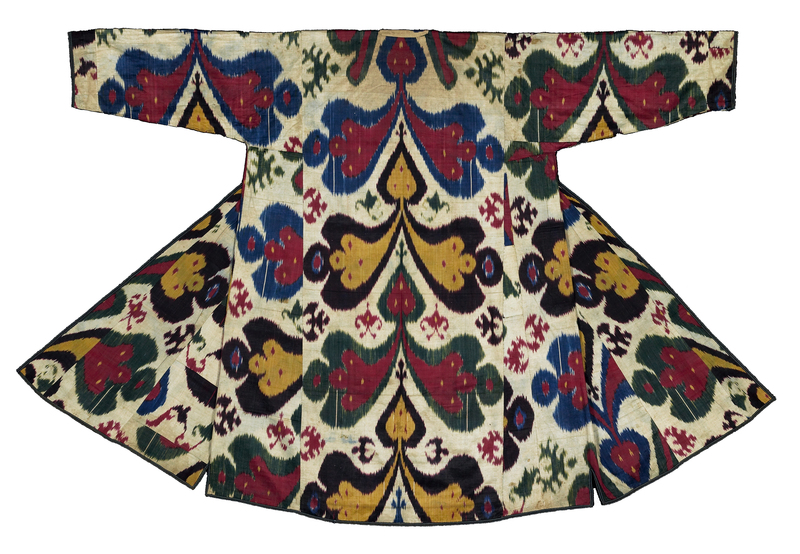 Robe, Central Asia, Uzbekistan, Bukhara or Fergana valley, mid-19th century. Silk, cotton 132 x 177 cm. The Textile Museum 2005.36.33. The Megalli Collection. Photo by Renee Comet. 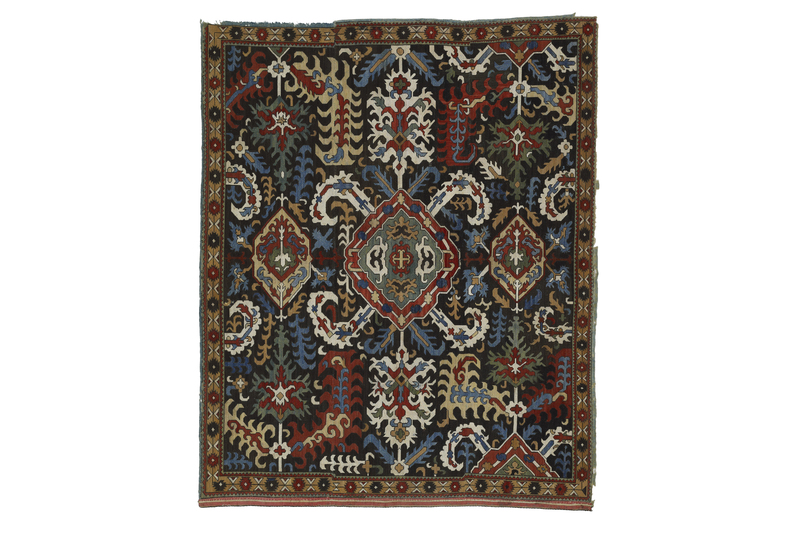 Carpet, Turkey, Kayseri, late 19th to early 20th century. Wool, cotton, 162 x 125 cm. The Textile Museum 1994.24.1. Gift of Farkhonde A. Edwards. Photo by Ben Cohen/Sotheby’s. 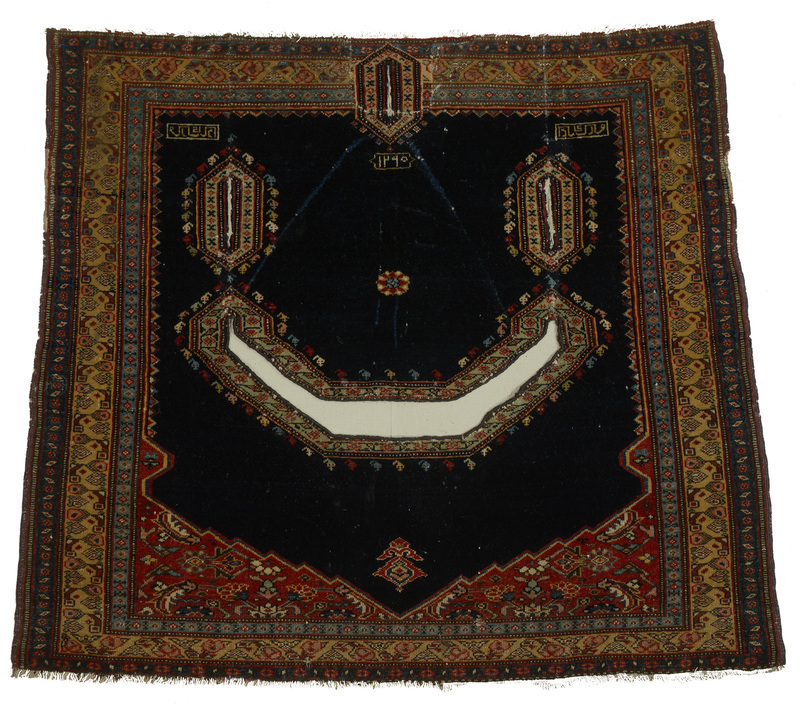 Saddle cover, Iran, Senneh, late 19th century. Wool, cotton, 89 x 102 cm. The Textile Museum 1961.39.17. Gift of Arthur D. Jenkins. Photo by Franko Khoury. 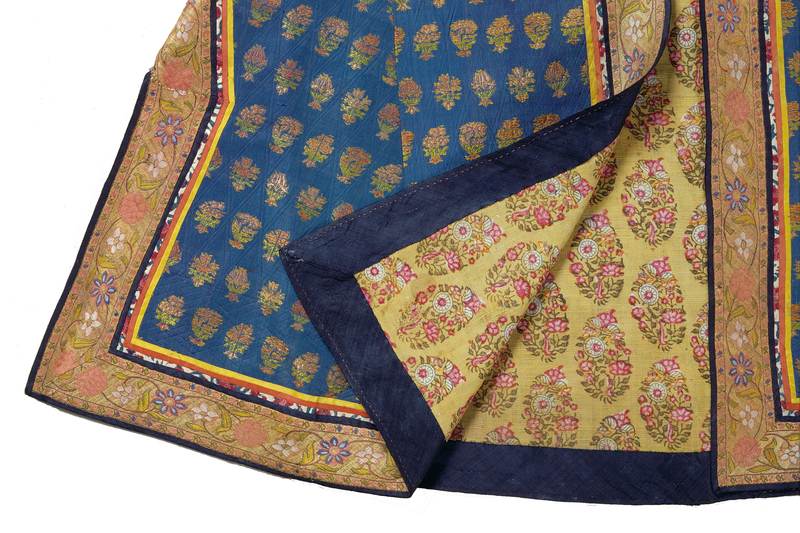 Kashmir shawl, India, mid-19th century. Wool, 82 x 80.5 cm. The Textile Museum 1982.40.1. Gift of Mrs. Charles Putnam. Photo by Sotheby’s. 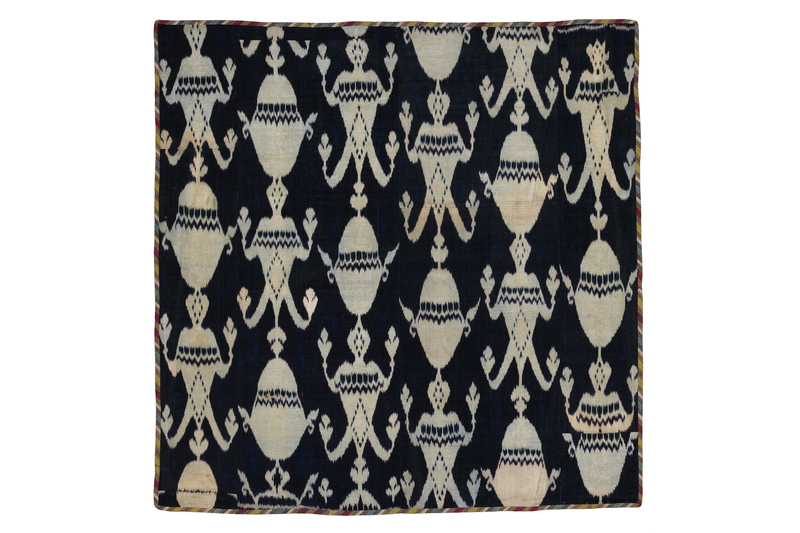 Pillow cover, Greek Islands, Cyclades, Naxos, 17th–18th century. Linen, silk, 111 x 44 cm. The Textile Museum 81.2. Acquired by George Hewitt Myers before 1940. Photo by Franko Khoury. 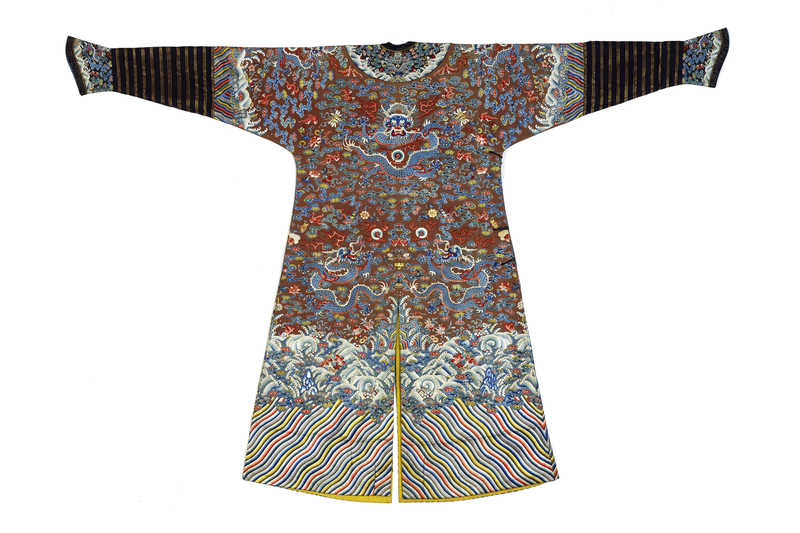 Taoist priest's robe, China, late 18th to early 19th century. 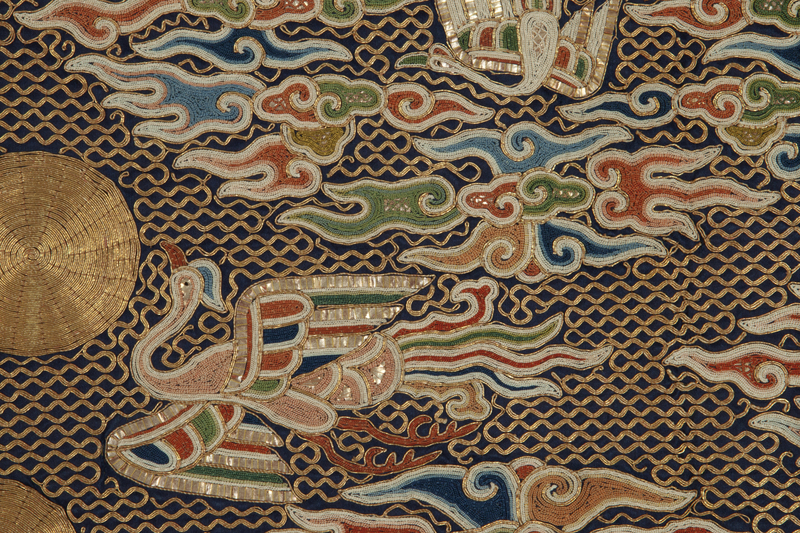 Silk, metallic-wrapped silk yarn, gilt paper, 115 x 180 cm. The Textile Museum 51.24. Acquired by George Hewitt Myers in 1929. Photo by Renee Comet. 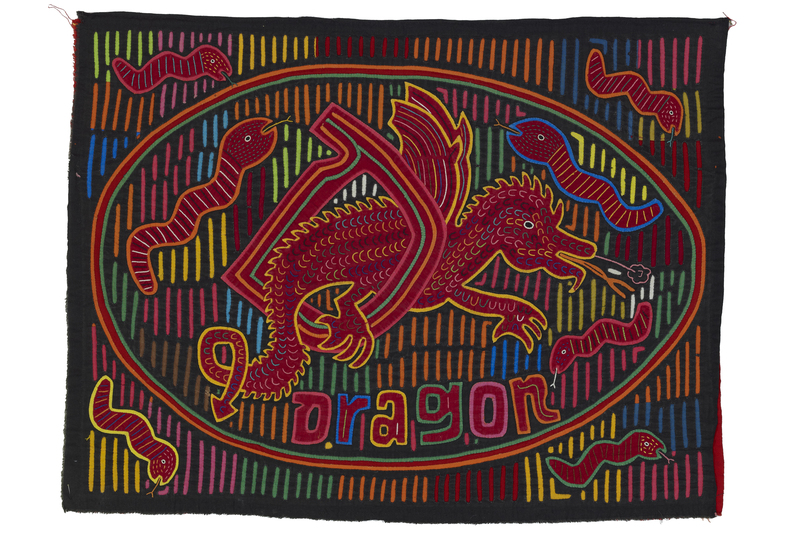 Raincloak (charkab), Bhutan, 20th century. Wool, 126 x 115 cm. The Textile Museum 1983.69.1. Ruth Lincoln Fisher Memorial Fund. Photo by Franko Khoury. 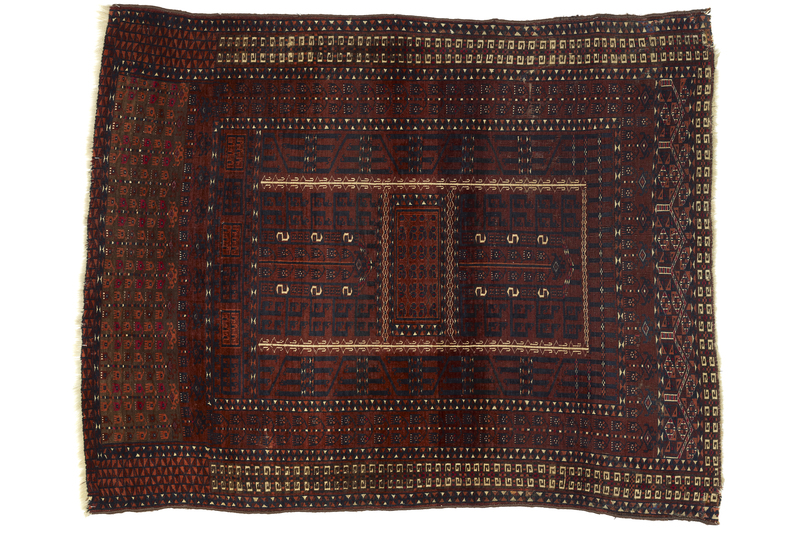 Ajar, Tunisia, early 20th century. Wool, cotton. The Textile Museum 2000.39.28. Gift of the Irmtraud H. Reswick Collection. Photo by Jeff Crespi. 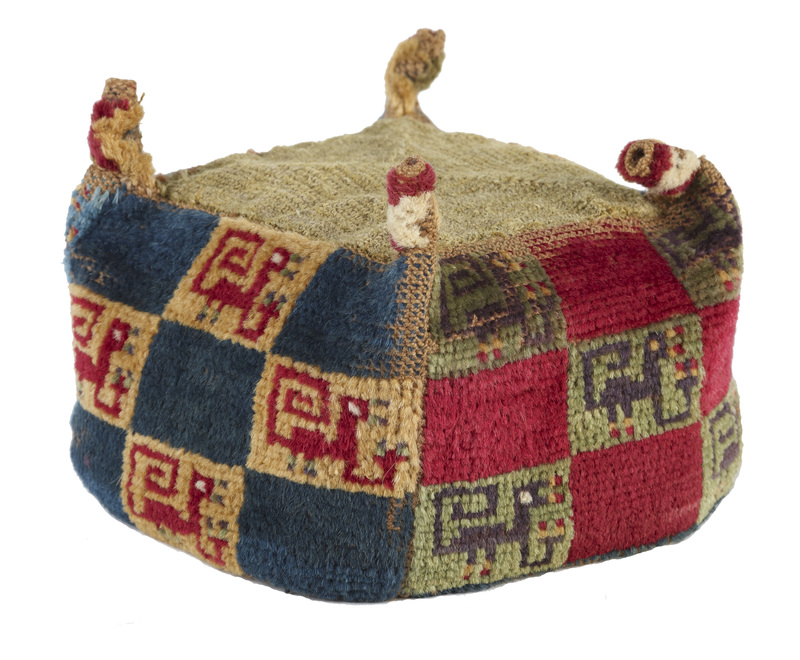 Hat, Peru, probably south coast, Huari style, 700–900 CE. Larkshead knotted foundation with supplementary pile, embroidered plain weave top, camelid hair, 14 x 14 x 11 cm. The Textile Museum 91.195. Acquired by George Hewitt Myers in 1936. Photo by Renee Comet. 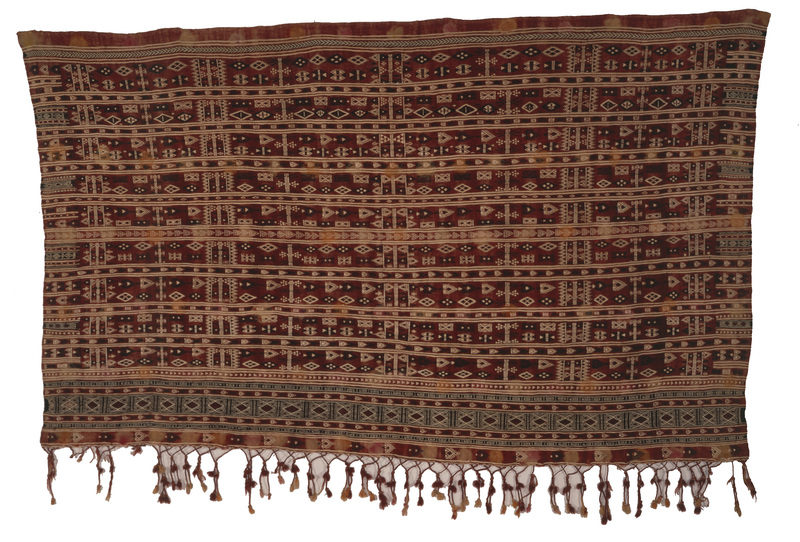 Shawl (iscayo), Bolivia, late 18th to early 19th century. 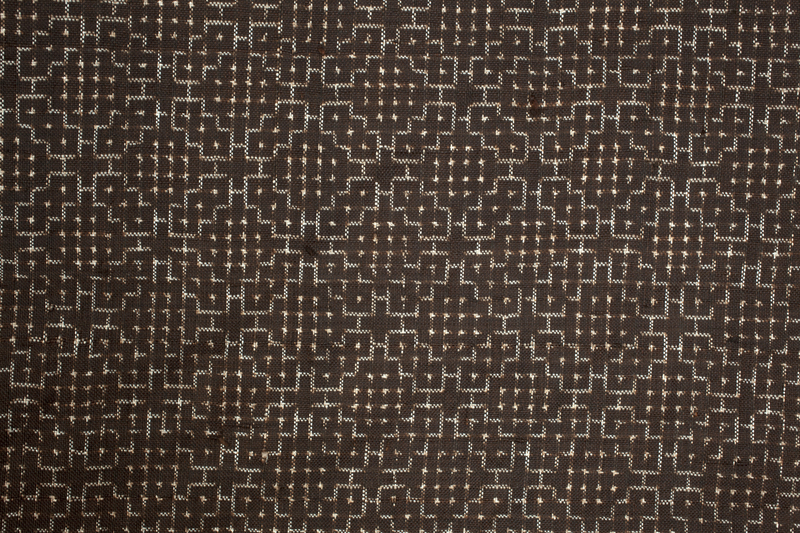 Alpaca hair, warp-faced plain weave, 107 x 127.5 cm. The Textile Museum 2003.31.11. Gift of Howard and Roberta Green Ahmanson. Dragon robe (龍袍, long pao) (front), China, late 18th to early 19th century. Silk, gold-wrapped yarns. The Textile Museum 1973.30. Gift of Brigadier General Regan Fuller. 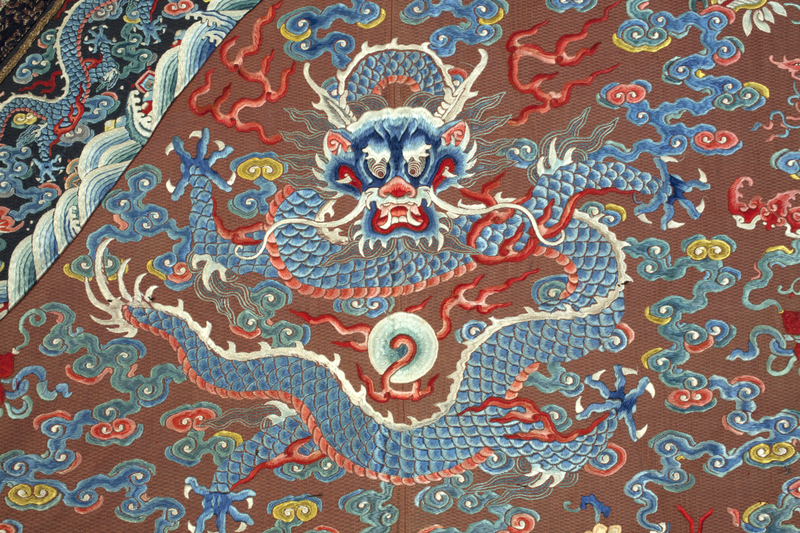 Dragon robe (龍袍, long pao) (front detail), China, late 18th to early 19th century. Silk, gold-wrapped yarns. The Textile Museum 1973.30. Gift of Brigadier General Regan Fuller. 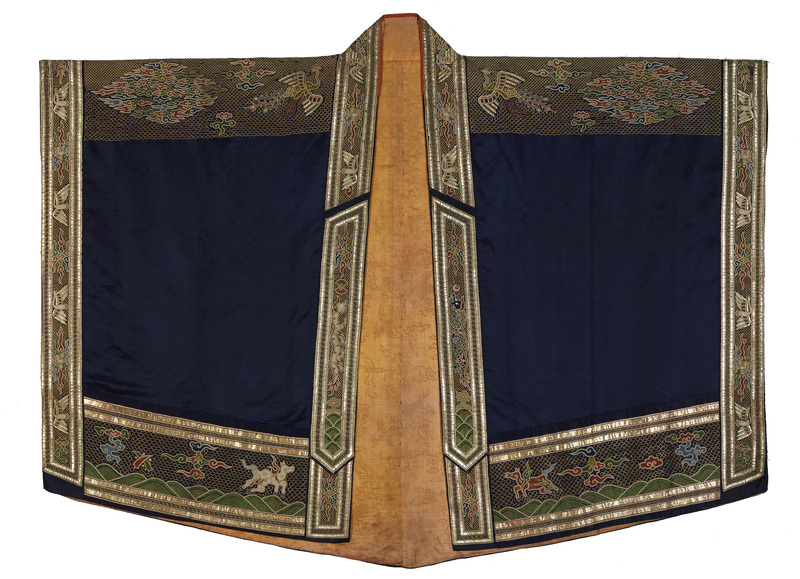 Dragon robe (龍袍, long pao) (back), China, late 18th to early 19th century. Silk, gold-wrapped yarns. The Textile Museum 1973.30. Gift of Brigadier General Regan Fuller. 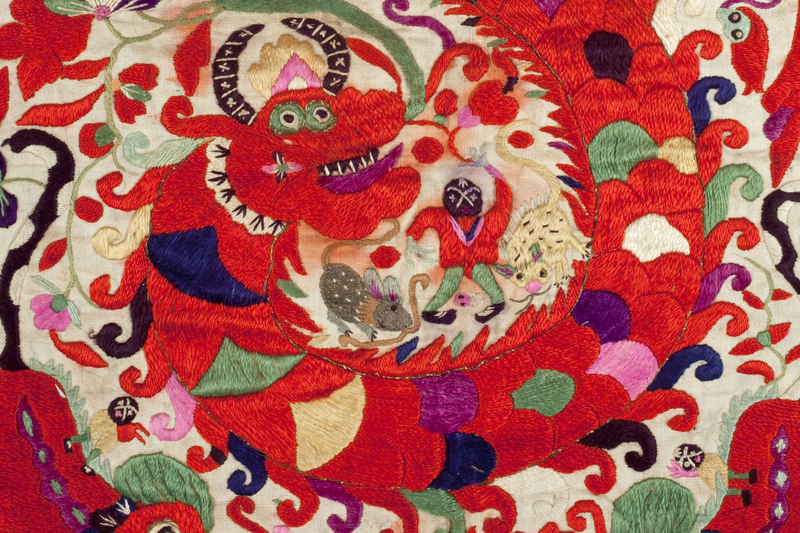 Dragon robe (龍袍, long pao) (back detail), China, late 18th to early 19th century. Silk, gold-wrapped yarns. The Textile Museum 1973.30. Gift of Brigadier General Regan Fuller. Mola panel, Panama, San Blas Islands, Kuna people, 1960s. Cotton. The Textile Museum 1985.56.56. Donated from the Collection of Jonathan Leonard. 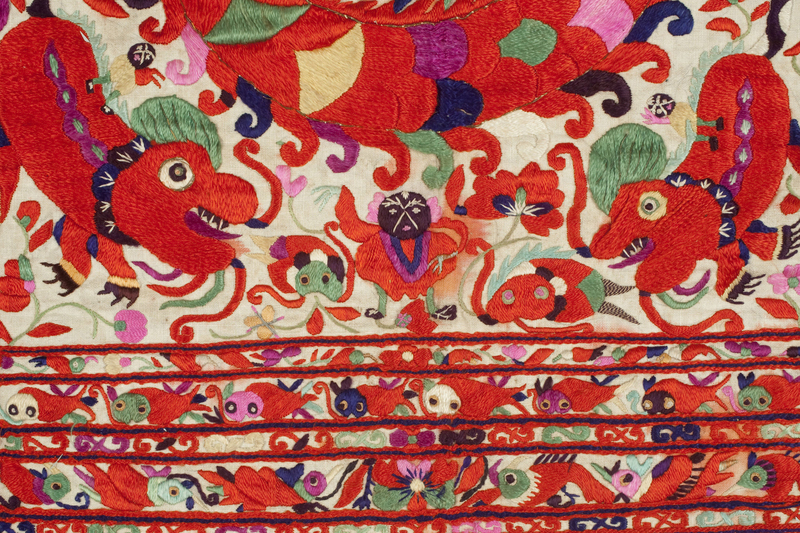 Apron (detail), China, Guizhou Province, Taijiang County, Shidong Village, Miao people, 20th century. Cotton, silk. The Textile Museum 1992.42.2. Ruth Lincoln Fisher Memorial Fund. Silk, gold-wrapped yarns, gilt paper. The Textile Museum 51.23. Acquired by George Hewitt Myers in 1929. Imperial surcoat (衮服, gun fu), China, early 18th century. Silk, gold-wrapped yarns, gilt paper. The Textile Museum 51.23. Acquired by George Hewitt Myers in 1929. 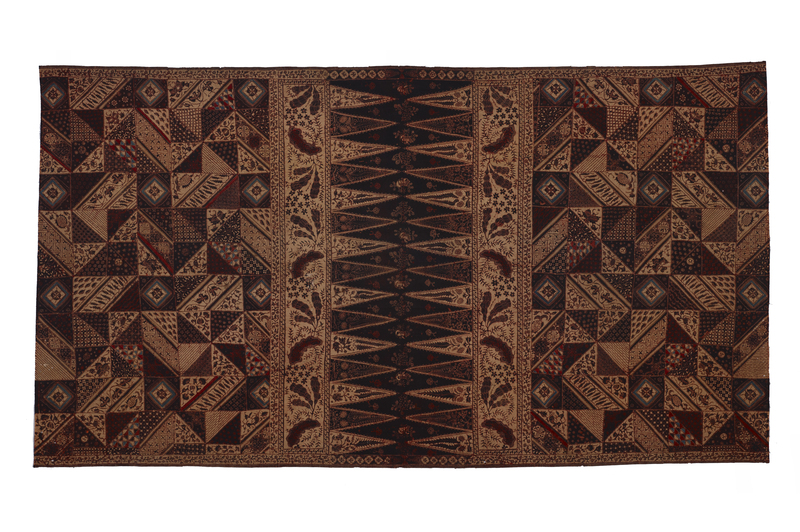 Door rug (engsi), Central Asia, Turkmenistan, Saryk people, third quarter of the 19th century. Wool, cotton. The Textile Museum 1977.36.8. Gift of Jerome A. and Mary Jane Straka. 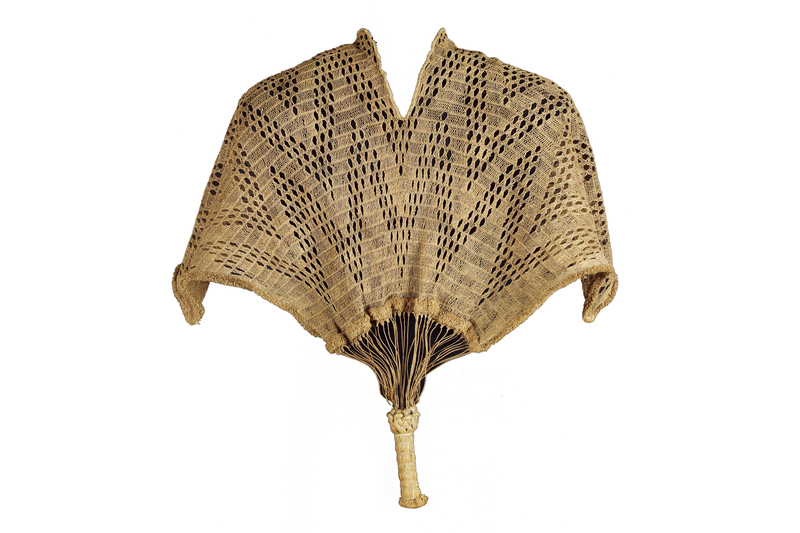 Neck scarf, collar (pañuelos), Philippines, 19th century. Piña. The Textile Museum 1996.18.20. Gifts of Mr. and Mrs. George Wagner White. 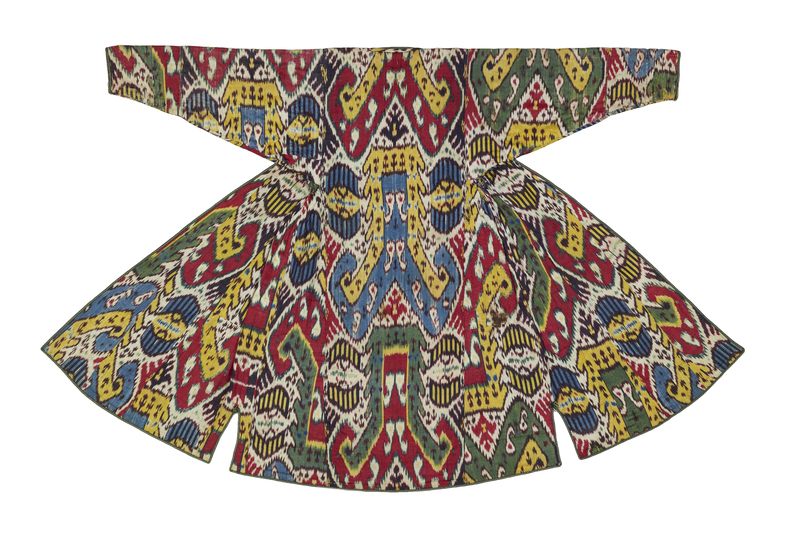 Robe (back), Central Asia, Uzbekistan, Bukhara, late 19th century. Silk, cotton. The Textile Museum 2005.36.98. The Megalli Collection. 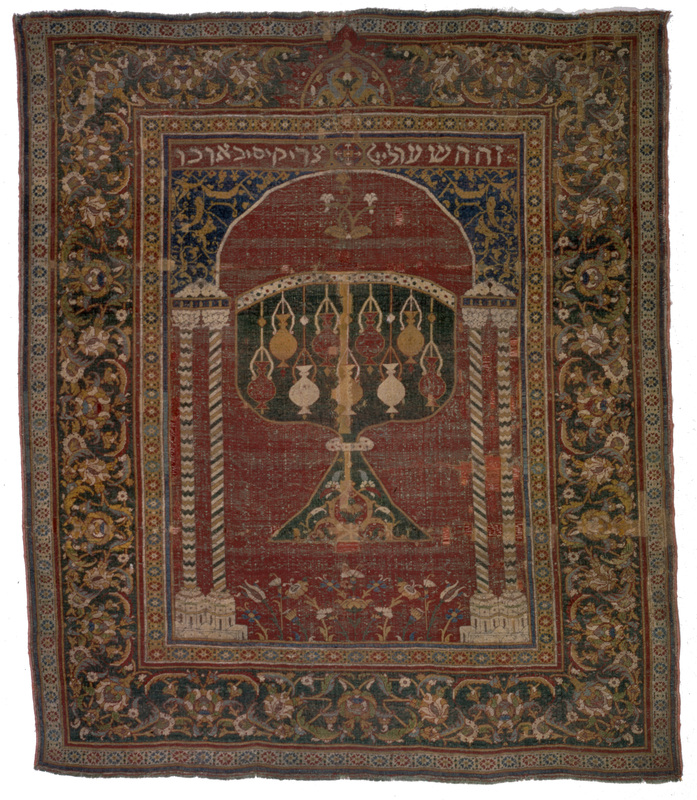 Rug, Caucasus, Shirvan, Derbend, late 19th century. Wool. The Textile Museum 2004.7.82. Gift of John and Donna Sommer. Kira, Bhutan, late 20th to early 21st century. Silk, cotton. The Textile Museum 2009.9.9. Elina Vesara Ostern Trust. 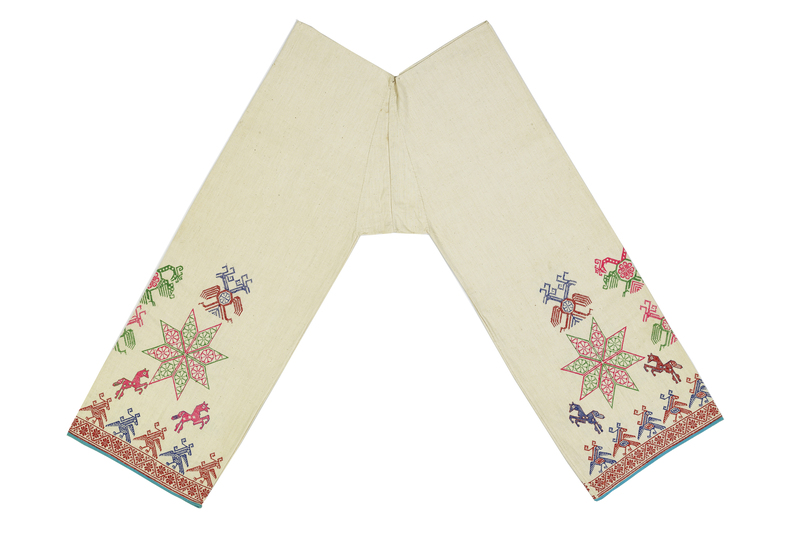 Fiesta pants, Mexico, state of Jalisco, Huichol people, mid-20th century. 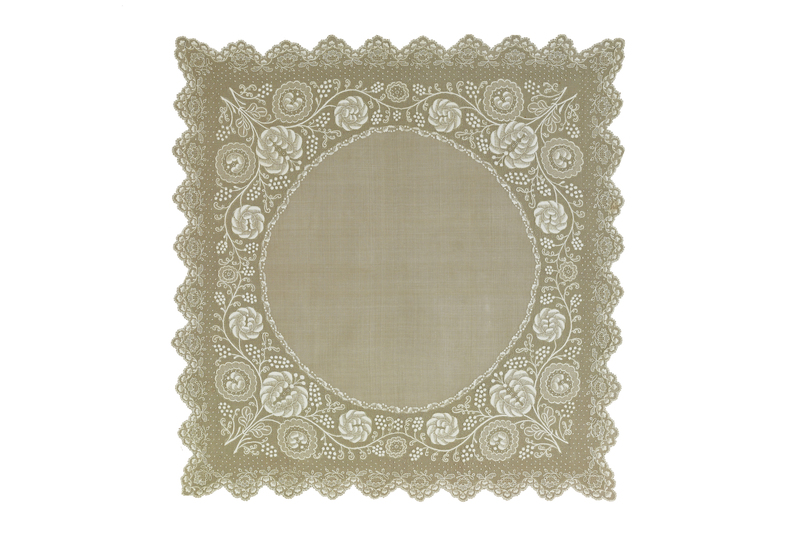 Cotton (commercial muslin), with wool embroidery. The Textile Museum 1965.66.15a. 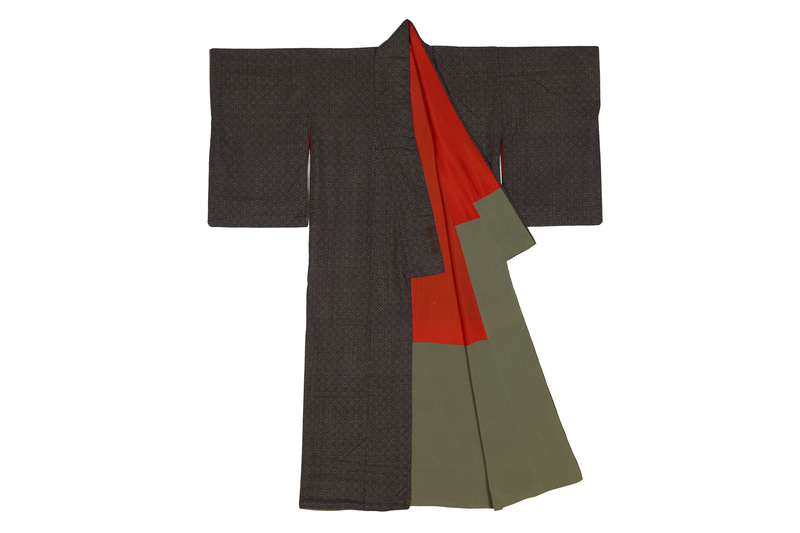 Kimono (kosode), Japan, Amami Oshima, early 20th century. Silk. The Textile Museum 2007.23.1. Gift of Jeffrey Krauss. Kimono (kosode) (detail), Japan, Amami Oshima, early 20th century. Silk. The Textile Museum 2007.23.1. Gift of Jeffrey Krauss. 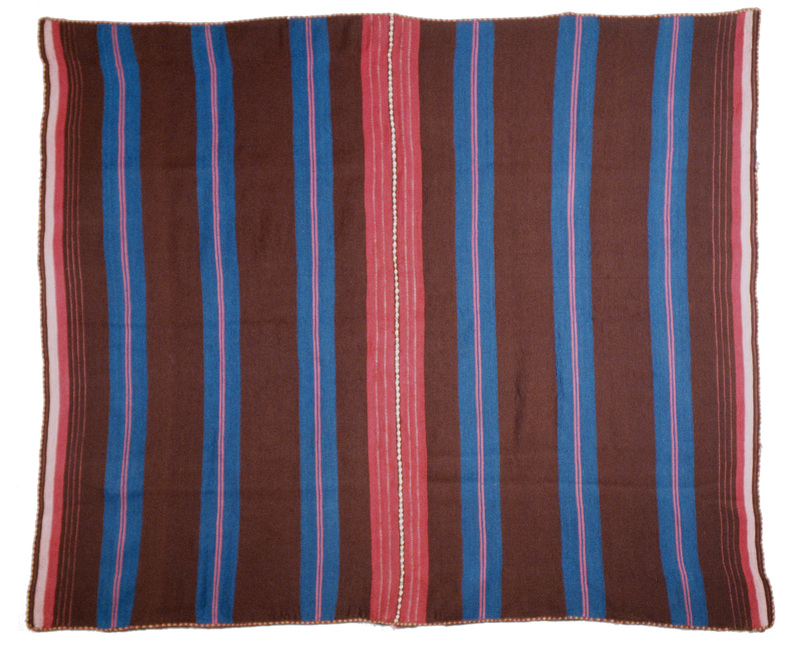 Carrying cloth (for lunch), woven by Nicolasa Quispe Chura, Peru, Cuzco department, Q’ero area, Wañuna Pampa hamlet, 1960–1976. Alpaca hair, 49 x 60 cm. The Textile Museum 1999.7.10. Gift of John Cohen. Photo by Renee Comet. 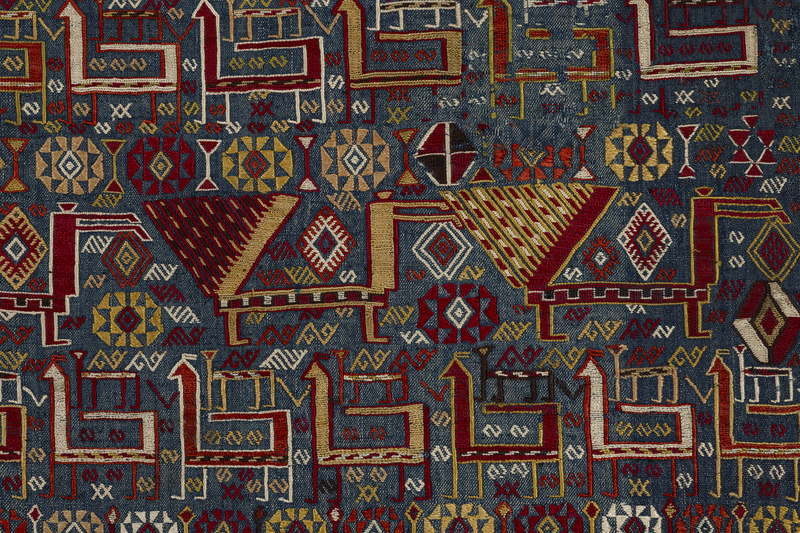 Carpet, Egypt, Cairo, Mamluk. ca. 1500. Wool. The Textile Museum R16.2.2. Acquired by George Hewitt Myers in 1952. 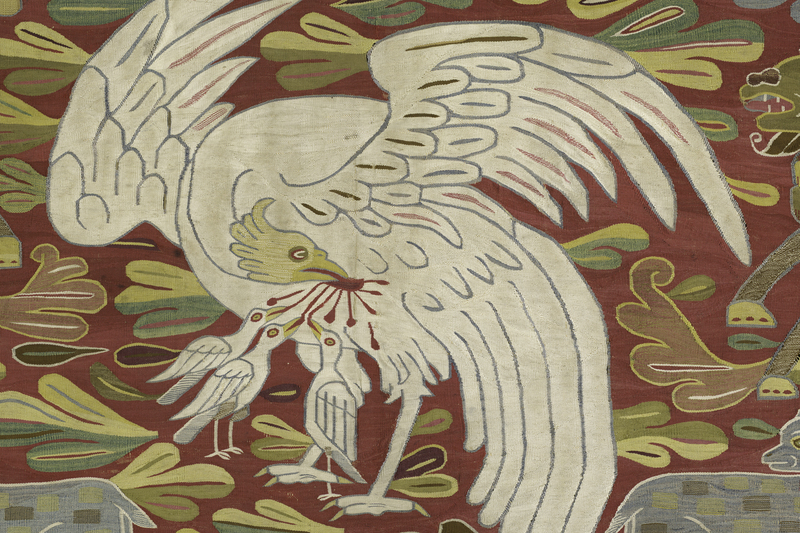 Cover (detail), Istanbul, late 17th century. Linen, silk, 256 x 160 cm. The Textile Museum 1.42. Acquired by George Hewitt Myers in April 1927. Seccade with design of a flowering tree, Demirci district, Manisa Province, West Anatolia, probably early 19th century. Wool, 148 x 101 cm. 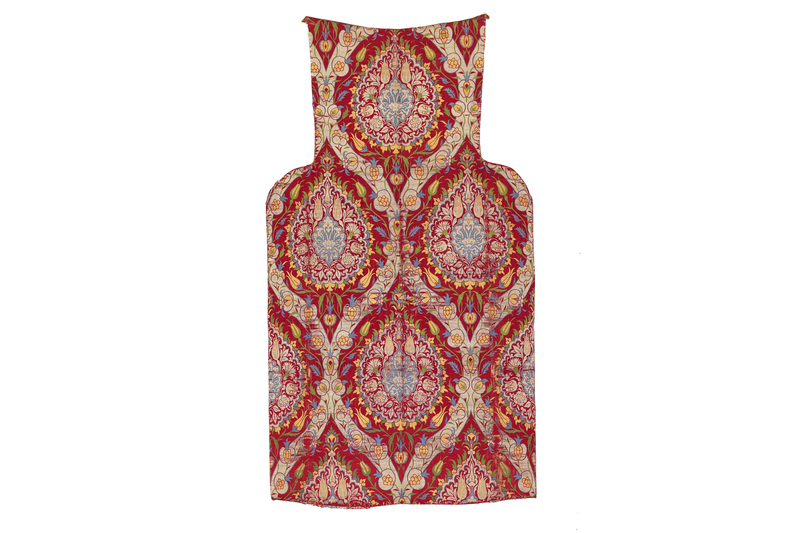 The Textile Museum 1971.23.8. The Rachel B. Stevens Memorial Collection. Fragment of green-ground kemha, Istanbul, first half 17th century. Silk, metallic-wrapped thread, 67.8 x 29 cm. The Textile Museum 1994.27.3. Gift of Neutrogena Corporation. 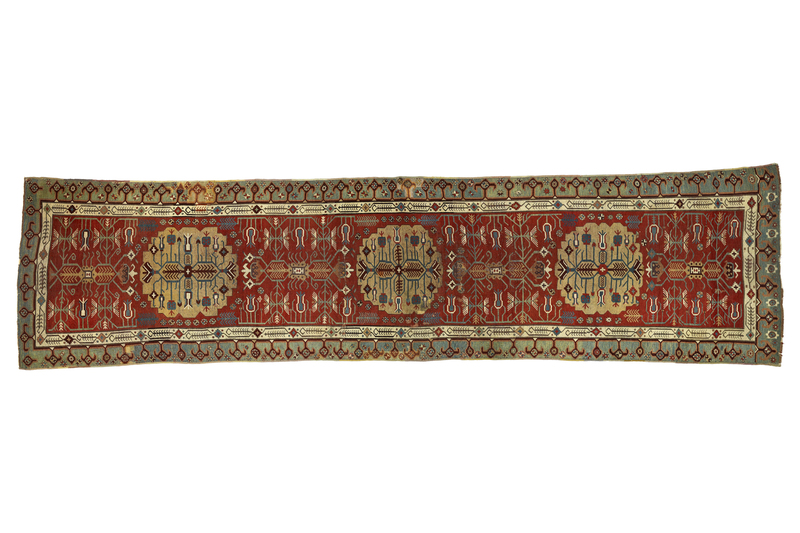 Floor spread (sofreh), Turkey, Ottoman Empire, late 17th or early 18th century. Linen, silk, 160 x 157.5 cm. The Textile Museum 2001.6.1. Gift of Roy P. Mottahedeh. Photo by Renee Comet. 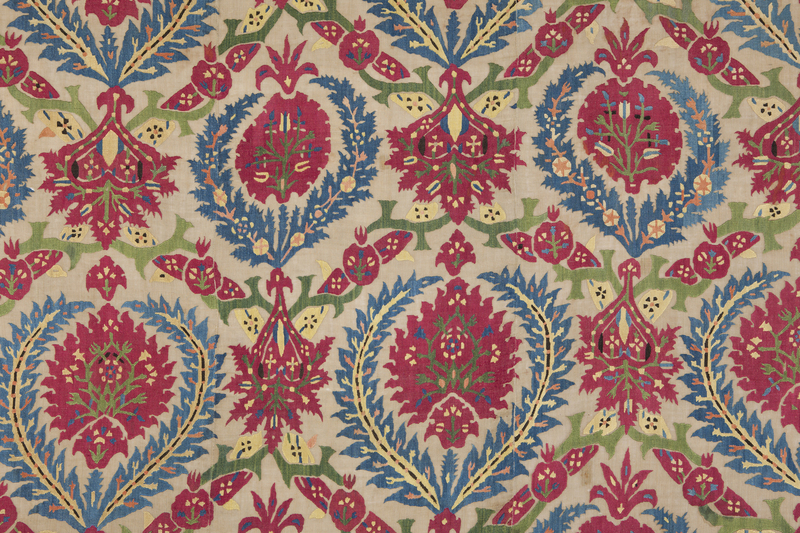 Wrapping cloth (bohça), Northwest Iran or Transcaucasia, 18th century. Silk, linen, 89 x 85.5 cm. The Textile Museum 3.33. Acquired by George Hewitt Myers. Sash (detail), Poland, 18th century. Silk and metallic-wrapped thread, 402 x 32.5 cm. The Textile Museum 82.12. Acquired by George Hewitt Myers in 1949. 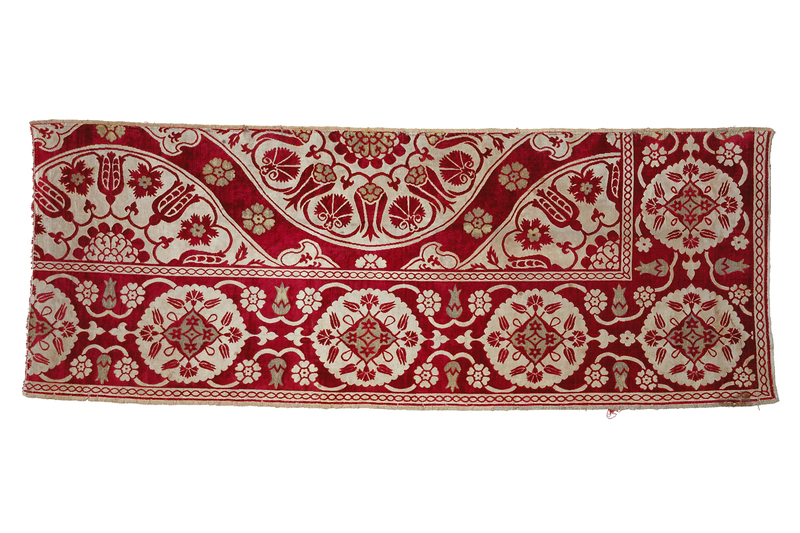 Loom-width length of velvet with ogival layout and floral design, Bursa or Istanbul, ca. 1550–1560. Silk, metallic-wrapped thread, 101 x 62 cm. The Textile Museum 83.10. Acquired by George Hewitt Myers in 1951. 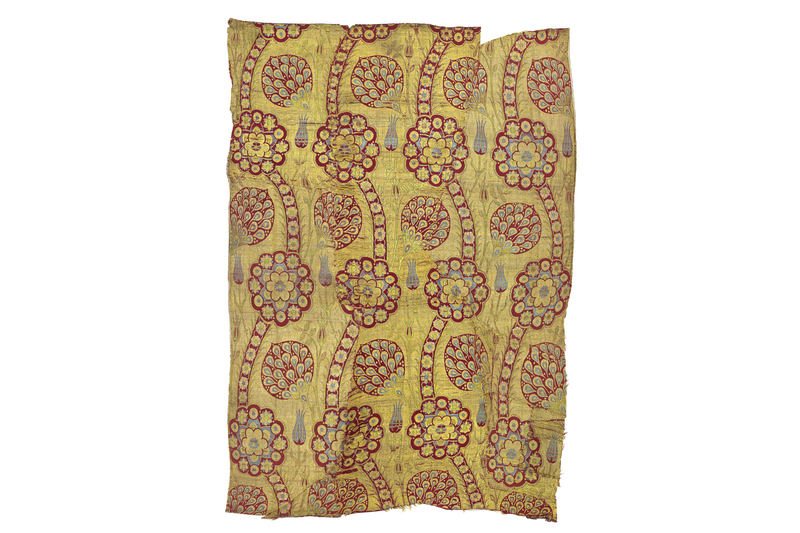 Fragment of yellow-ground kemhal, Istanbul, second half 16th century. Silk, metallic-wrapped thread, 91 x 64 cm. The Textile Museum 1.47. Acquired by George Hewitt Myers in 1947. 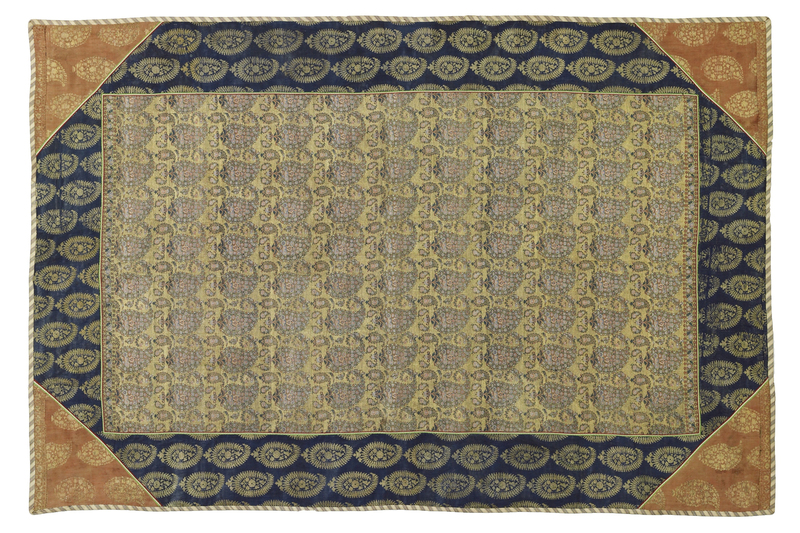 Loom-width fragment of a velvet cover, Bursa, late 16th to early 17th century. Silk, metallic-wrapped thread, cotton, 174 x 66 cm. The Textile Museum 1.55. Acquired by George Hewitt Myers in 195. 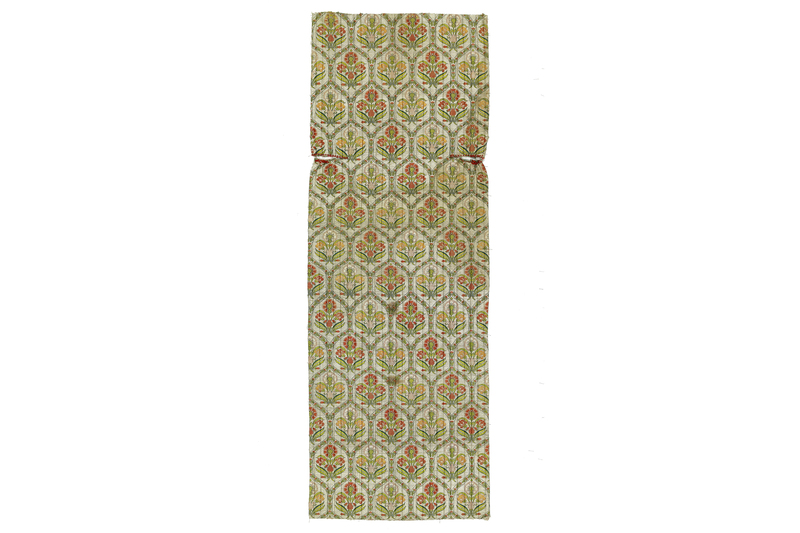 Fragment of a floral serenk from a costume, probably Istanbul, late 16th century. Silk, metallic-wrapped thread, 126.5 x 69 cm. The Textile Museum 1.57. Acquired by George Hewitt Myers in 1951. Fragment of a silver-ground Safavid textile, Iran, 18th century. Silk and metallic-wrapped thread, 92 x 47 cm. The Textile Museum 1.69. Acquired by George Hewitt Myers in 1952. 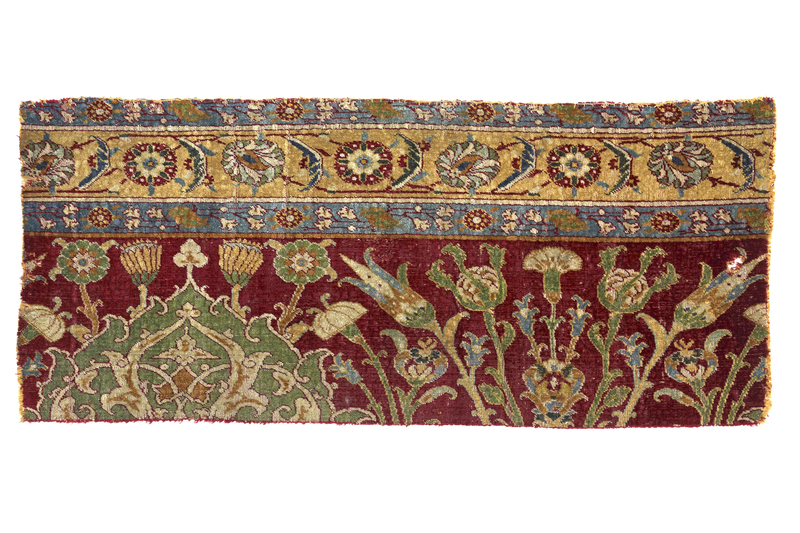 Loom-width of ogival-layout kemha with carnations (detail), Bursa, 17th century. Silk, metallic-wrapped thread, 82 x 67 cm. The Textile Museum 1.73b. Acquired by George Hewitt Myers in 1952. 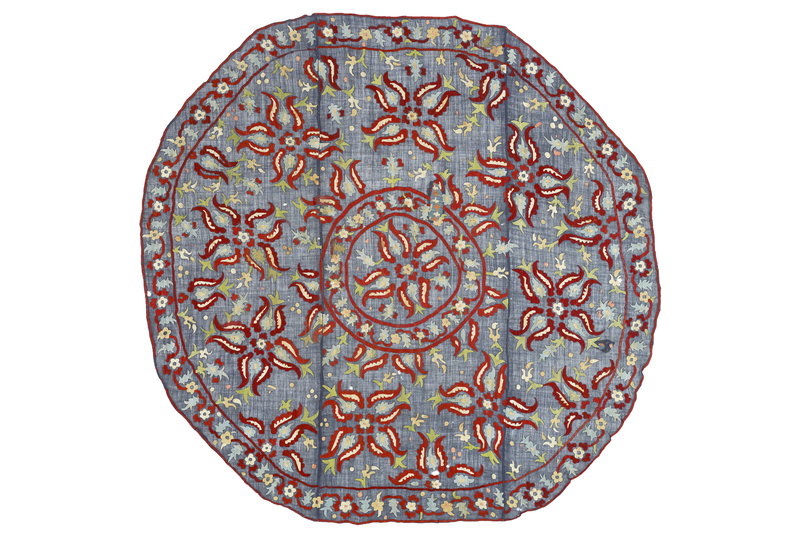 Cushion cover, Ottoman, Istanbul, Turkey, 17th century. Silk, cotton, metallic-wrapped thread, 108.5 x 66 cm. The Textile Museum 1.54. Acquired by George Hewitt Myers in 1951. Photo by Renee Comet. 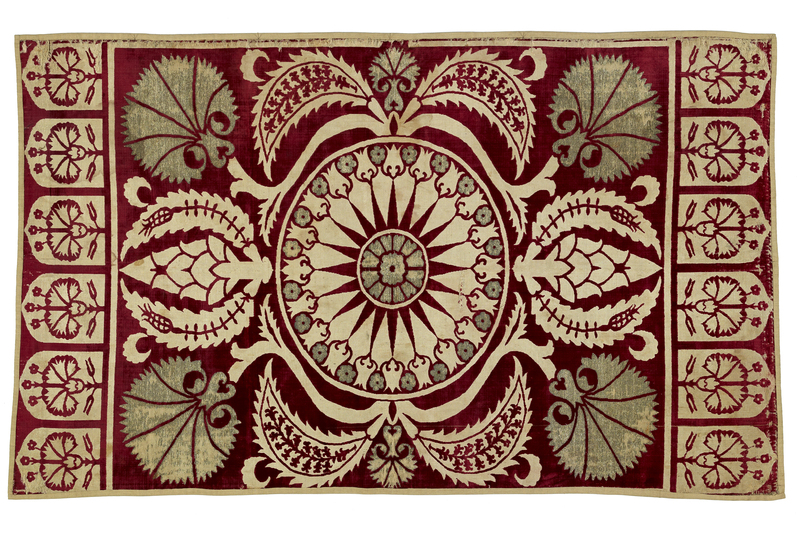 Fragment of a floral court carpet, probably Cairo, Egypt, second half of the 16th century. 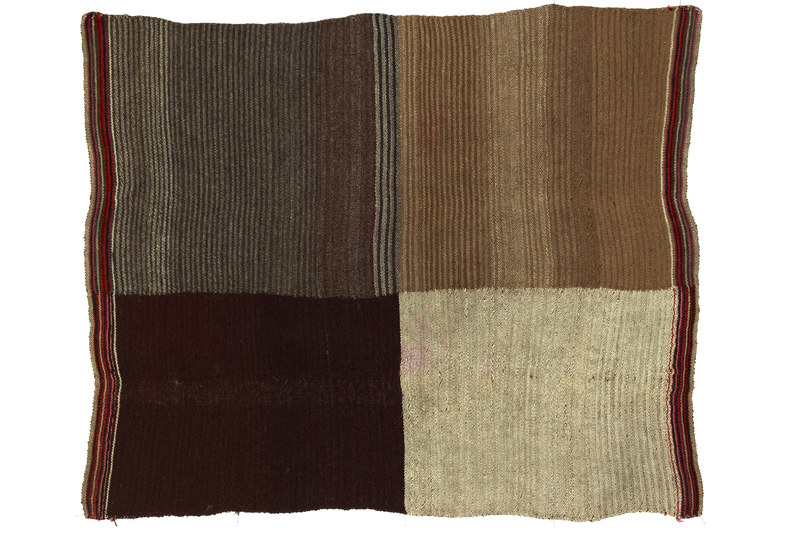 Wool, 102 x 44 cm. The Textile Museum R16.4.6. Acquired by George Hewitt Myers in 1952. 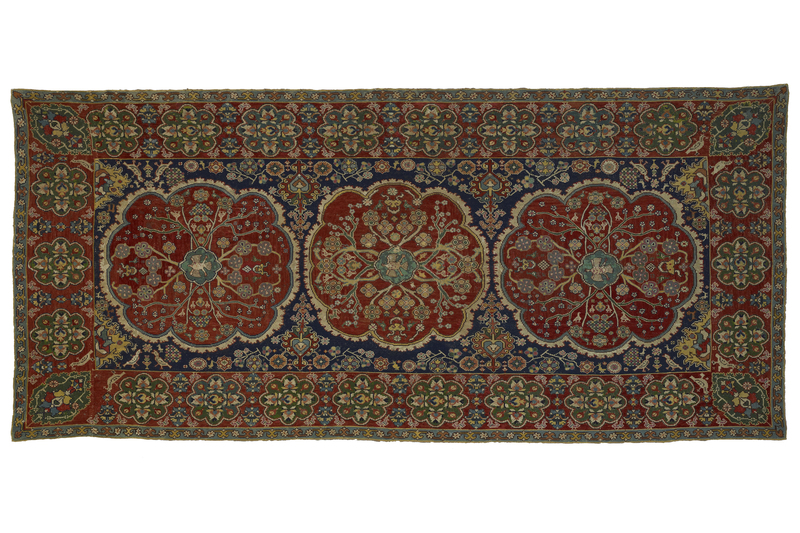 Small ‘Kara Memi’ carpet with two quatrefoil medallions, probably Karapınar district, Konya Province, South-central Anatolia, probably 18th century. Wool, 256 x 156.5 cm. The Textile Museum R34.00.1. Acquired by George Hewitt Myers in 1949. 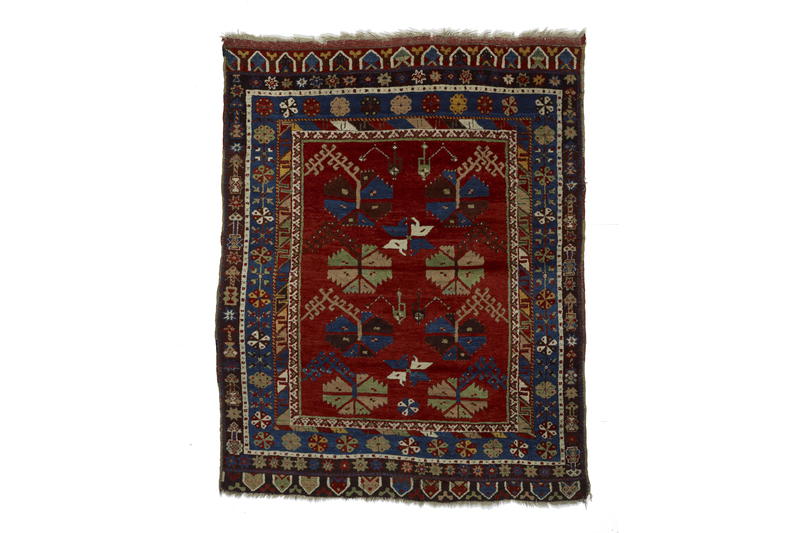 Small red-ground carpet with carnations, probably South-west Anatolia, 19th century. Wool, 164 x 131.5 cm. The Textile Museum R34.2.6. Acquired by George Hewitt Myers in 1912. 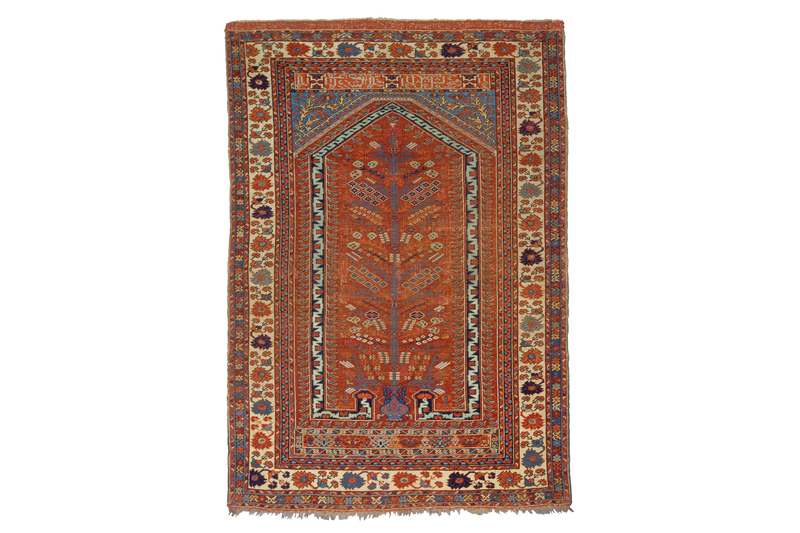 Carpet with floral design, Demirci, Manisa Province, West Anatolia, probably mid-19th century. Wool, 160.5 x 132.5 cm. The Textile Museum R34.5.1. Acquired by George Hewitt Myers in 1912. 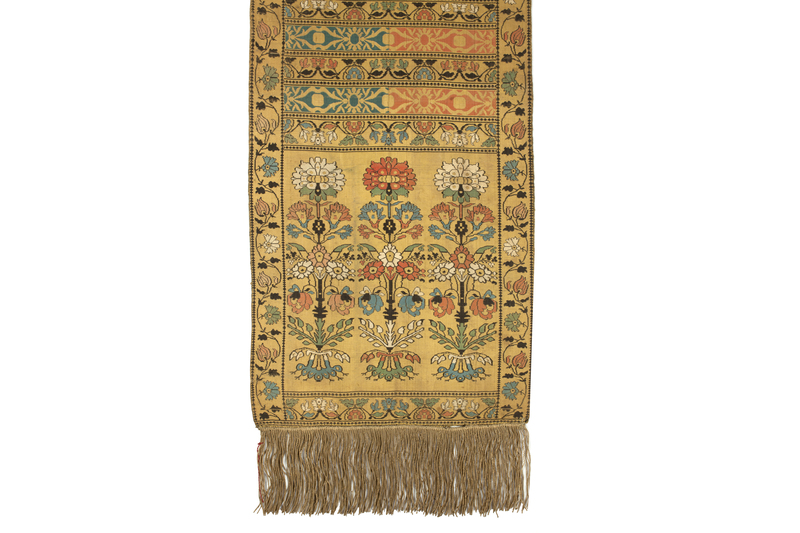 ‘Kara Memi’ long rug with floral design, Central Anatolia, probably late 18th/early 19th century. Wool, 510 x 128 cm. The Textile Museum R34.7.2, Acquired by George Hewitt Myers. 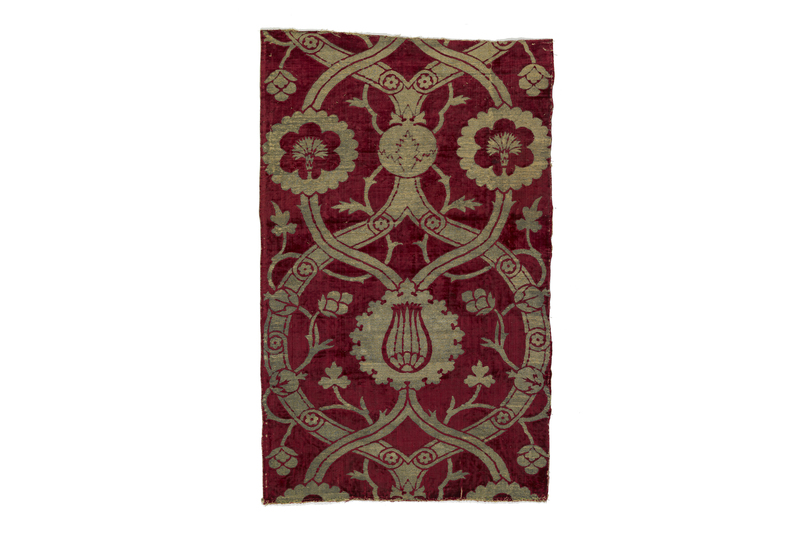 Fragment of red-ground kemha, Istanbul, third quarter 16th century. Silk, metallic-wrapped thread, 62.5 x 67.5 cm. The Textile Museum 1.68b. Acquired by George Hewitt Myers in 1952. 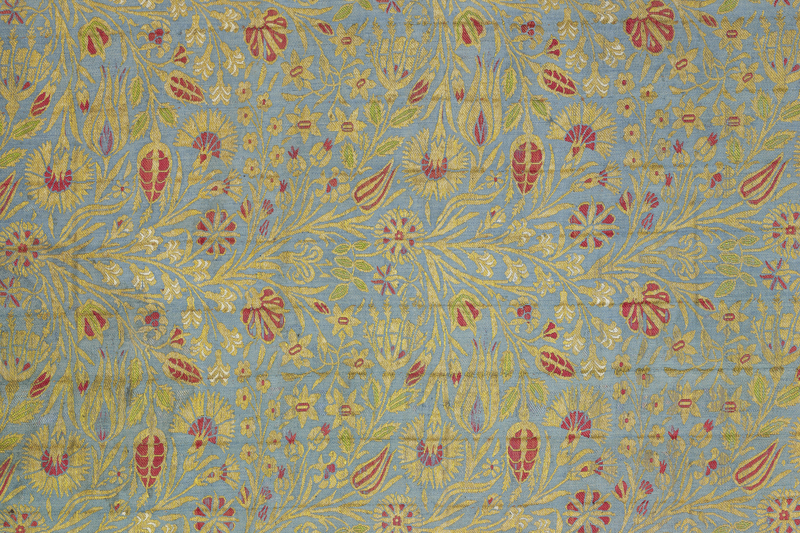 Kemha with small-scale floral decoration (detail), probably Istanbul, last quarter of 16th century. Silk, metallic-wrapped thread, 162 x 66 cm. The Textile Museum 1.72. Acquired by George Hewitt Myers in 1952. 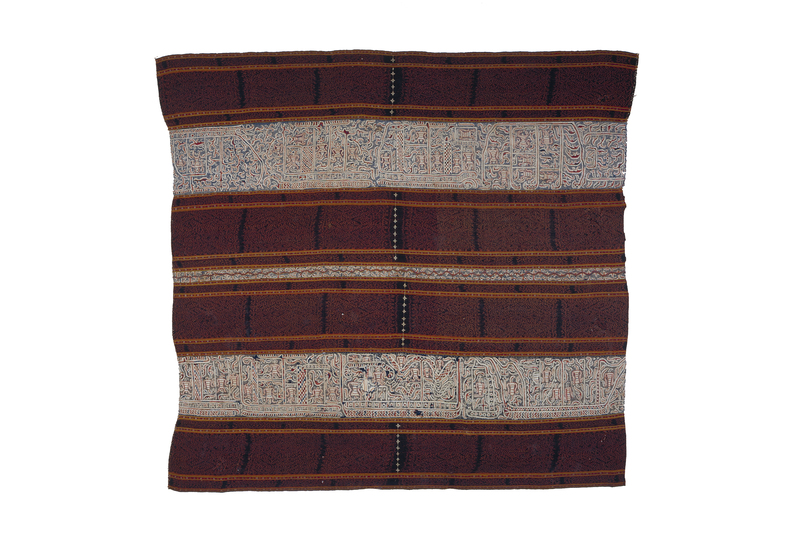 Loincloth end panel, Peru, north coast, Chimu style, ca. 1250–1350. Cotton and camelid hair, 52.6 x 49.8 in. The Textile Museum 1960.6.1. Museum purchase. Loincloth end panel (detail), Peru, north coast, Chimu style, ca. 1250–1350. Cotton and camelid hair, 52.6 x 49.8 in. The Textile Museum 1960.6.1. Museum purchase. 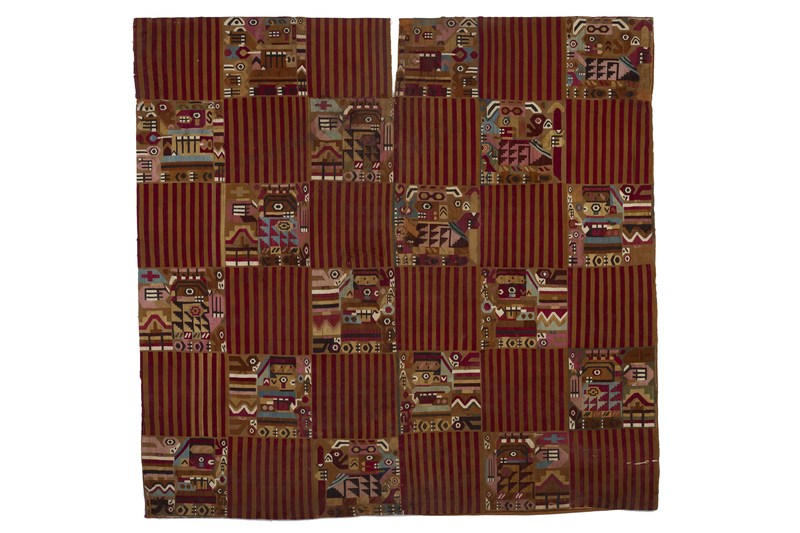 Man’s tunic, Peru, Wari style, 8th–9th century. Cotton and camelid hair, 41.6 x 43.1 in. The Textile Museum 1962.30.1. Museum purchase. 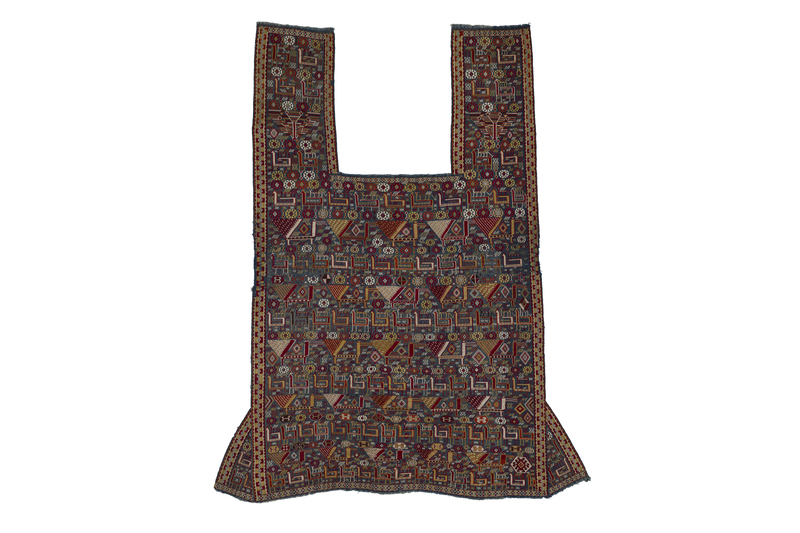 Horse cover, northwestern Iran or Caucasus, Shahsevan people, second half of the 19th century. Silk, metallic-wrapped silk, 60 x 48 in. The Textile Museum 1979.35.3. Gift of Arthur D. Jenkins. 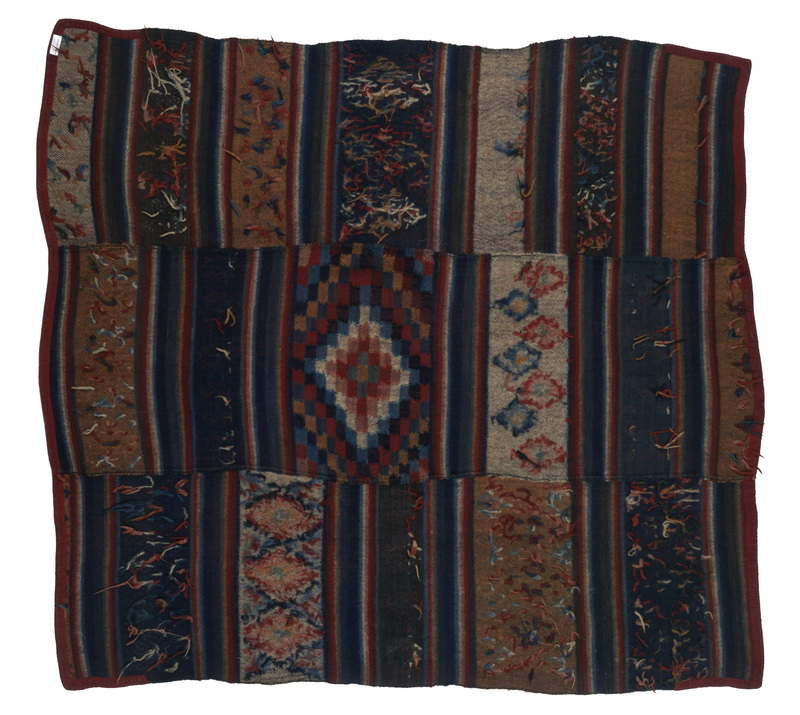 Horse cover (detail), northwestern Iran or Caucasus, Shahsevan people, second half of the 19th century. Silk, metallic-wrapped silk, 60 x 48 in. The Textile Museum 1979.35.3. Gift of Arthur D. Jenkins. Ceremonial camel trapping (Asmalyk), Tekke people, Central Asia, Turkmenistan, 19th century. Wool, 50 x 32.5 in. The Textile Museum 1980.13.2. Gift of Arthur D. Jenkins. 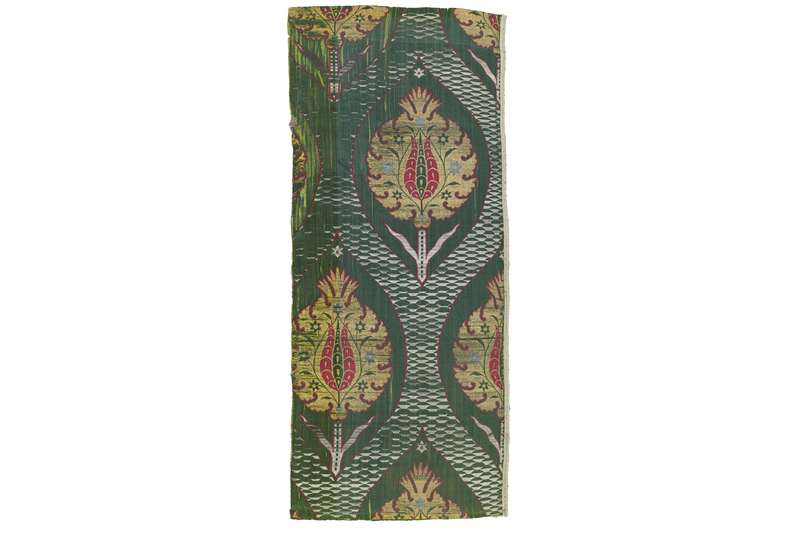 Hip wrapper (Tapis), Indonesia, Sumatra, Lampung Paminggir people, 19th century. Cotton, silk yarns, 50 x 47.3 in. The Textile Museum 1982.37.2. Ruth Lincoln Fisher Fund. 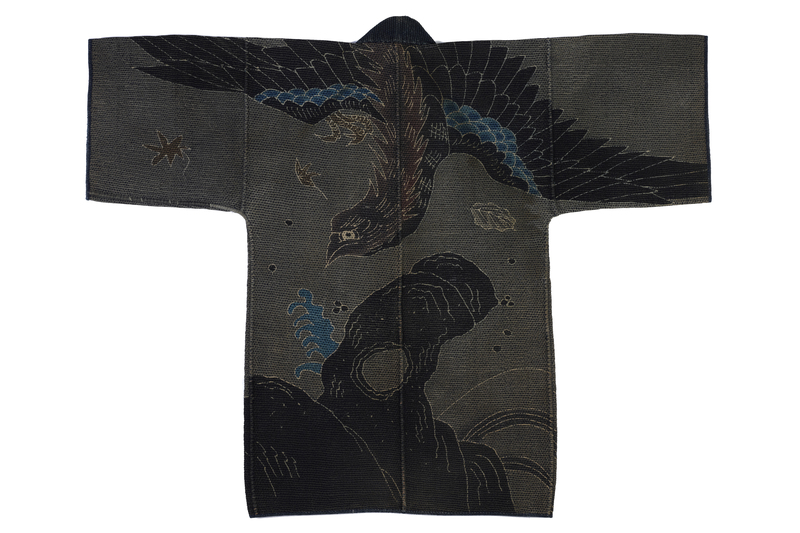 Fireman’s Coat (back), Japan, late Edo period, first half 19th century. Cotton, 46.3 x 37.5 in. The Textile Museum 1983.65.2. Ruth Lincoln Fisher Memorial Fund. Sarung, Indonesia, Java, Indramayu (? ), Javanese people, mid-20th century. Cotton, 78.8 x 43.7 in. The Textile Museum 1985.12.15. Gift of Mary Jane and Sanford Bloom. 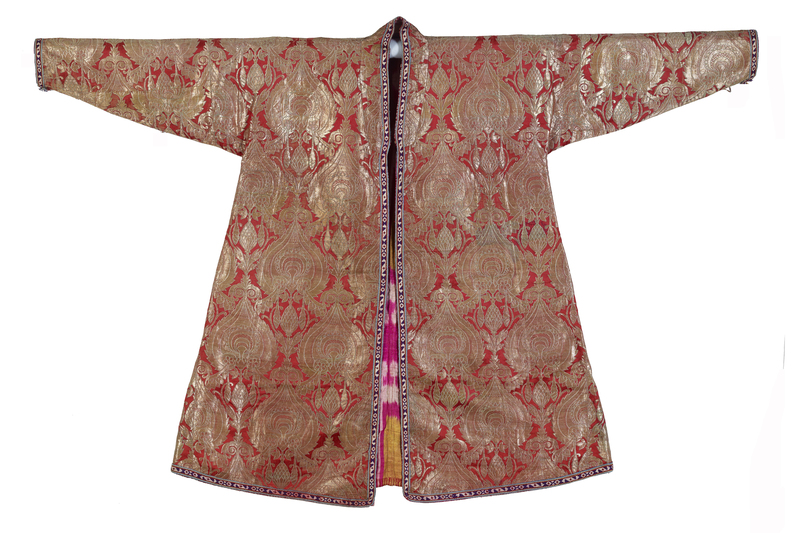 Empress or empress dowager’s surcoat (long Gua) (detail), worn during wedding celebrations, China, late 19th century. Silk, metal-wrapped yarns, 46.9 x 63.9 in. The Textile Museum 1985.33.288. Gift of The Florence Eddowes Morris Collection, Goucher College. Jacket (detail), Iran, Saavid Dynasty, 17th century. Silk, metallic-wrapped silk, 38 x 63 in. The Textile Museum 1985.5.1. Ruth Lincoln Fisher Memorial Fund. 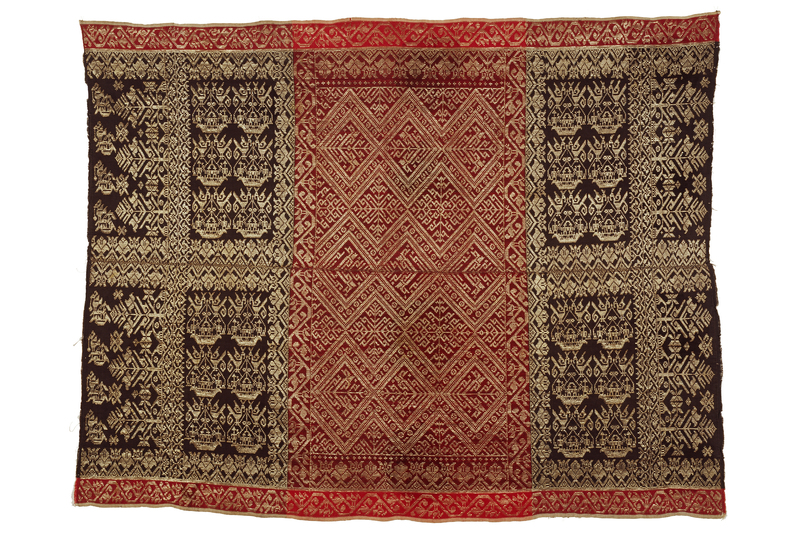 Sarung, Indonesia, Indonesian Chinese (Peranakan), 19th century. Cotton, 76 x 41 in. The Textile Museum 1991.32.1. Gift of Mary Jane and Sanford Bloom. 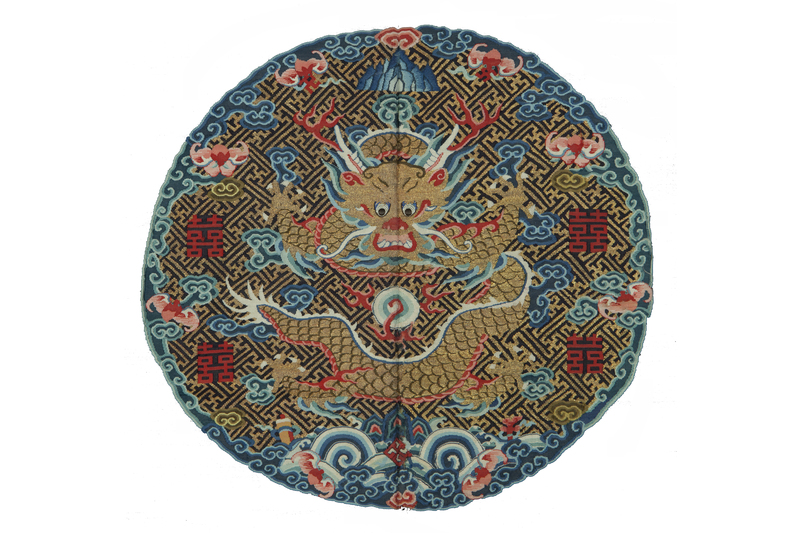 Hat worn by a sixth-rank civil official, China, late 19th to early 20th century. Velvet, fringe, bead, metallic clasp, 6 x 10.5 in. The Textile Museum 1993.3.2. Gift of Dr. and Mrs. Ausey Robnett. 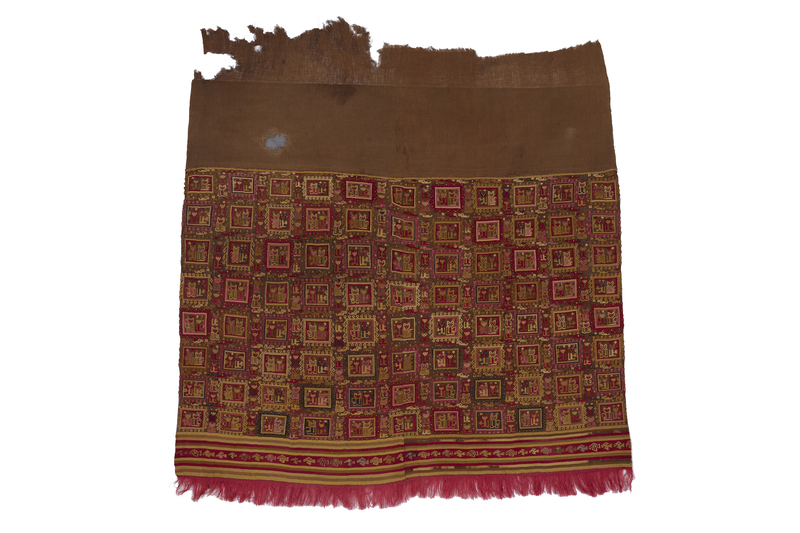 Skirt (kre alang), Semawa People, Indonesia, Sumbawa, early 20th century (?). Cotton, metallic-wrapped yarns. The Textile Museum 2000.25.16. Gift of the Christensen Fund. Embroidered Kazakh man’s coat, Uzbekistan, Tashkent(? ), second half of the 19th century. Fur, doeskin, silk, cotton, 51 x 89 in. The Textile Museum 2002.5.1. Gift of Caroline McCoy-Jones. 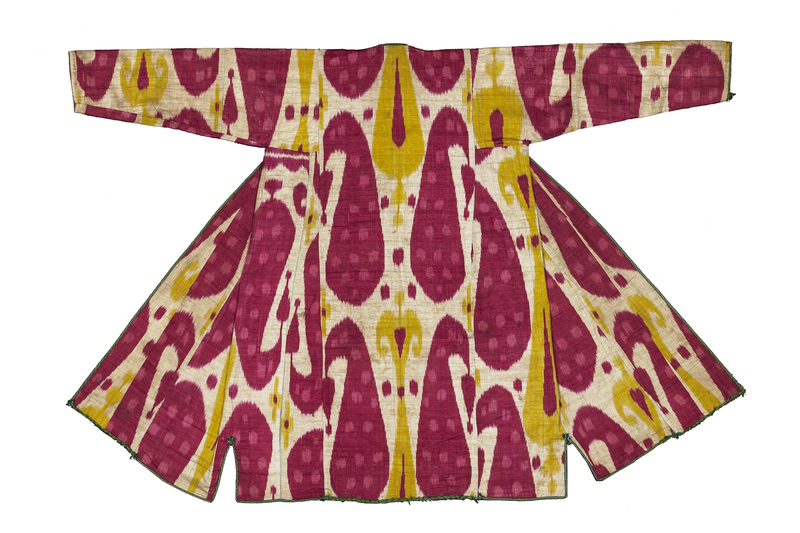 Robe, Uzbekistan, Bukhara, late 19th century. 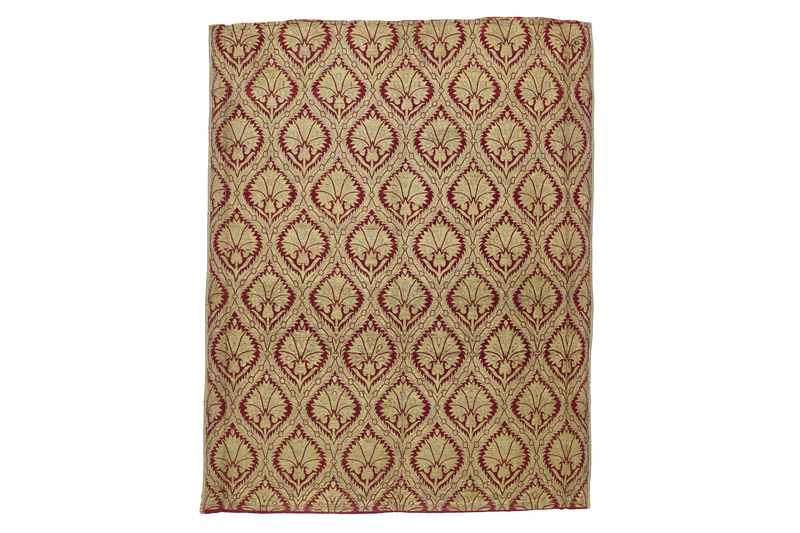 Silk, metallic-wrapped thread; brocaded, supplementary-weft patterning, warp ikat, warp twining, 80.5 x 55.5 in. The Textile Museum 2011.11.1. Gift of Guido Goldman. 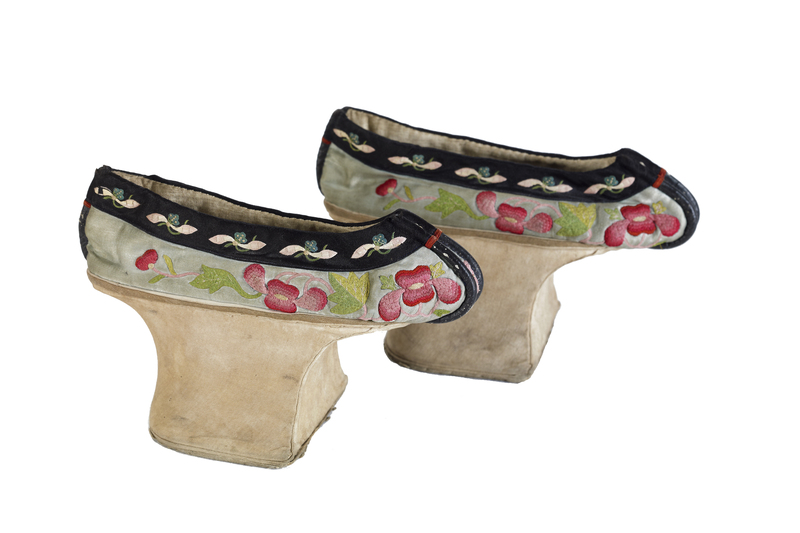 Shoes for a Manchu noblewoman, China, late 19th century. Silk, wood, 9 x 4 x 5 in. The Textile Museum 2011.12.1a and b. Gift of Susan and Charles Devillier in memory of Reverend and Mrs. Leonard J. Larson. 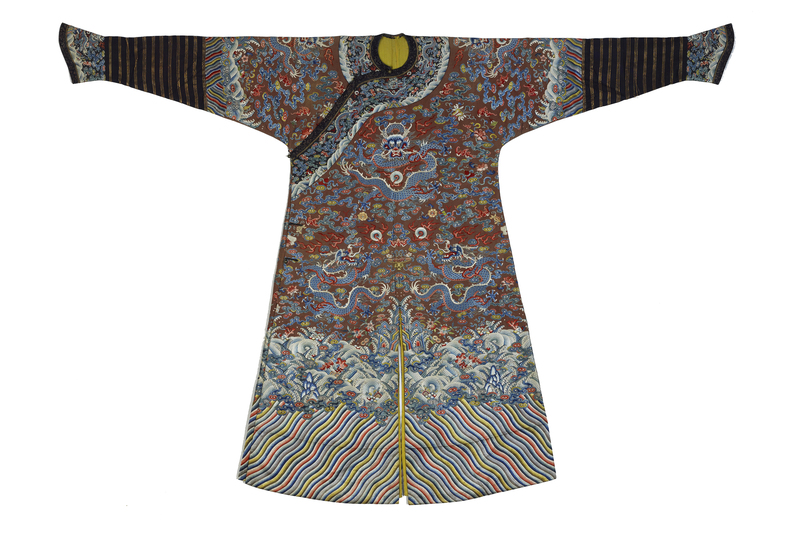 Daoist priest’s robe, China, late 18th to early 19th century. Silk, metal-wrapped yarns, 45.3 x 70.9 in. The Textile Museum 51.24. Acquired by George Hewitt Myers in 1929. 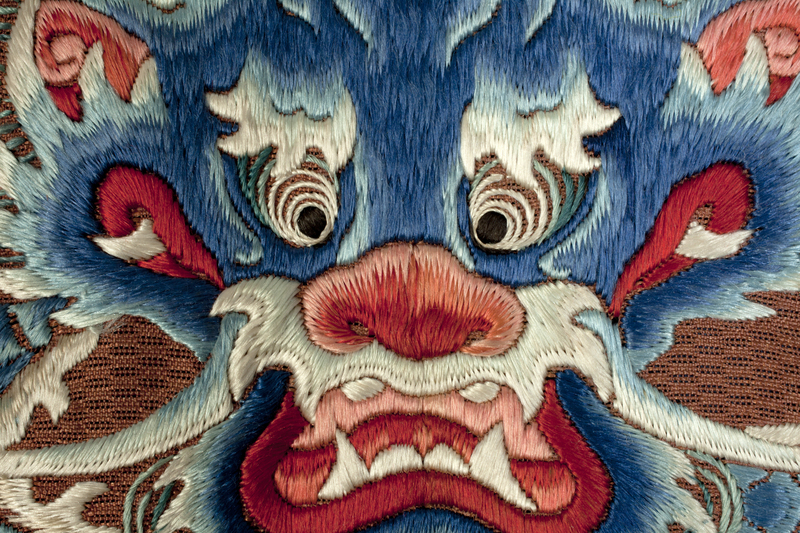 Daoist priest’s robe (detail), China, late 18th to early 19th century. Silk, metal-wrapped yarns, 45.3 x 70.9 in. 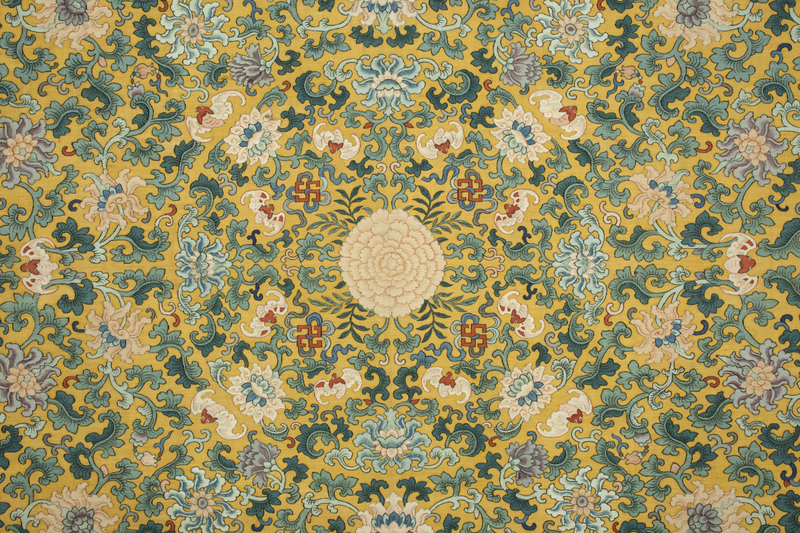 The Textile Museum 51.24. Acquired by George Hewitt Myers in 1929. 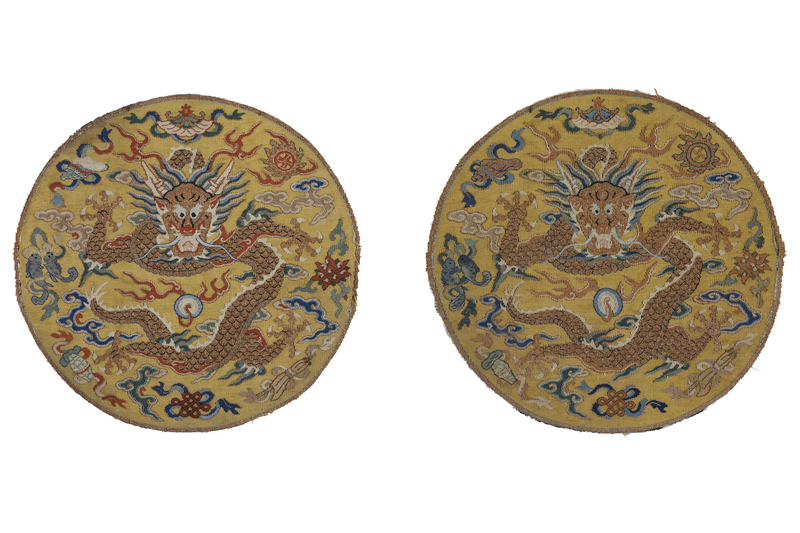 Imperial insignia roundels, China, late 18th to early 19th century. 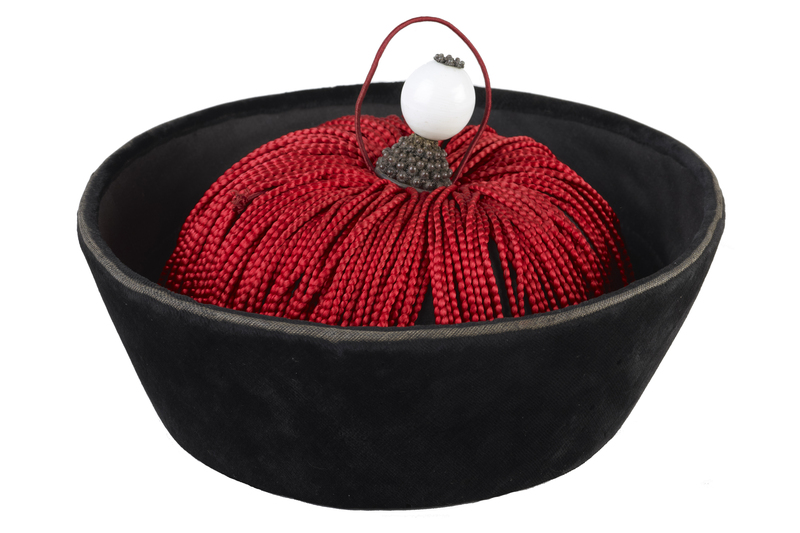 Silk, metal-wrapped yarns; diameter: 4.9 in. The Textile Museum 51.29a and b. Acquired by George Hewitt Myers in 1931. 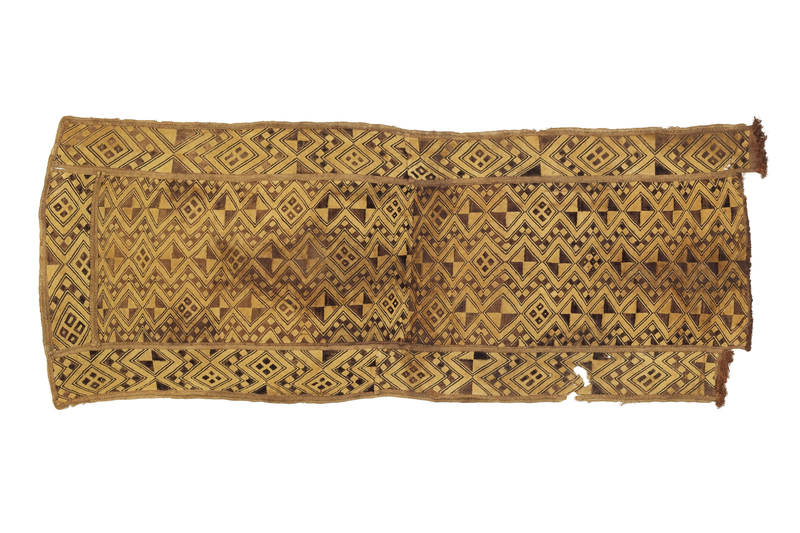 Man’s tunic, Peru, Inca style, ca. 1410–1532. Camelid hair, 37.5 x 30.9 in. The Textile Museum 91.147. Acquired by George Hewitt Myers. 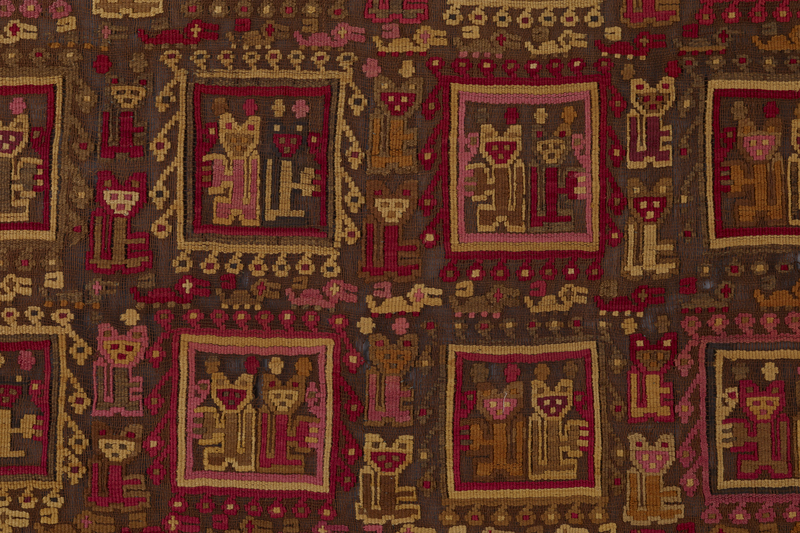 Table cover or wall hanging (detail), Peru, south highlands, last quarter of the 17th century. Cotton, camelid hair, silk, 68.9 x 64.2 in. The Textile Museum 91.504. Acquired by George Hewitt Myers in 1951. 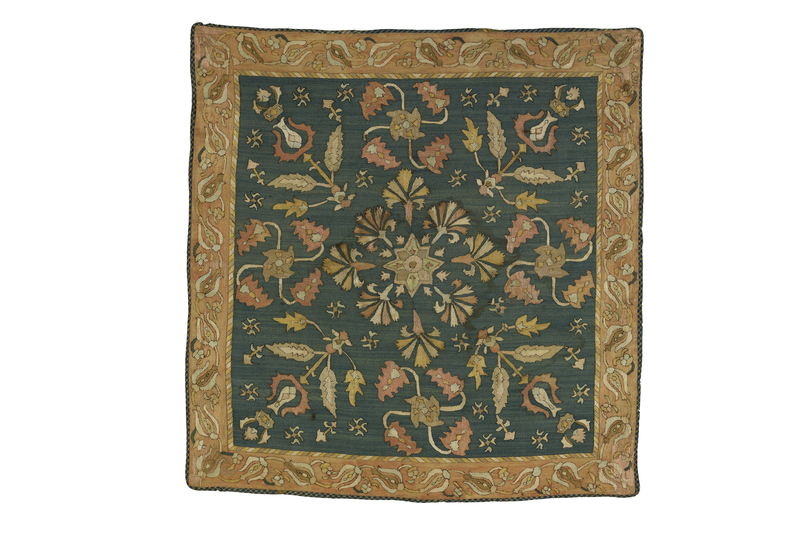 Embroidered panel, Caucasus, possibly Karabagh, 18th–19th century. Cotton, silk, 152 X 125 cm. The Textile Museum 2.18. Acquired by George Hewitt Myers in 1952. Photo by Renee Comet. 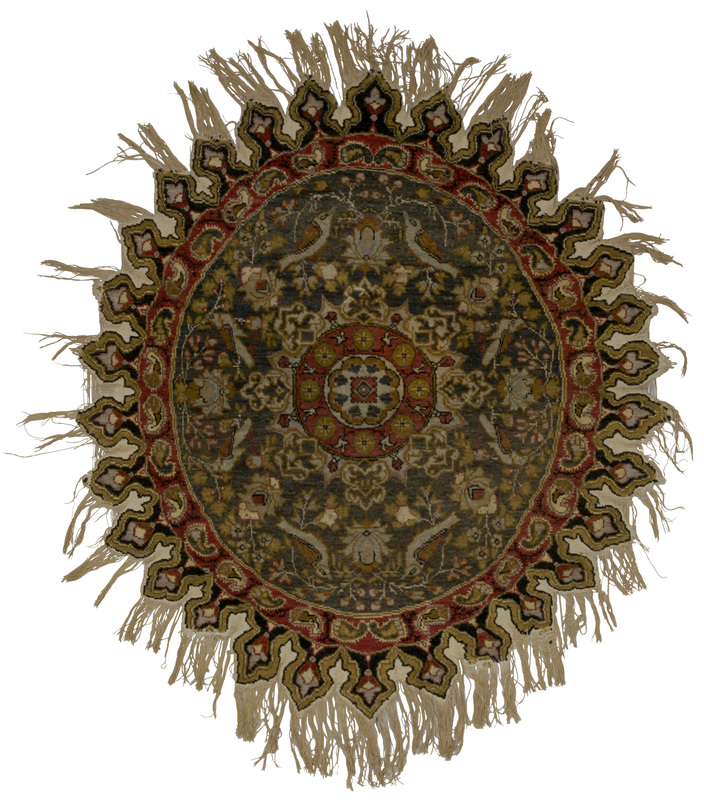 Embroidered cover or hanging, Portugal, Arraiolos, 17th century. Linen, wool, 151.5 x 70 in. The Textile Museum R44.6.1. Acquired by George Hewitt Myers in 1945. 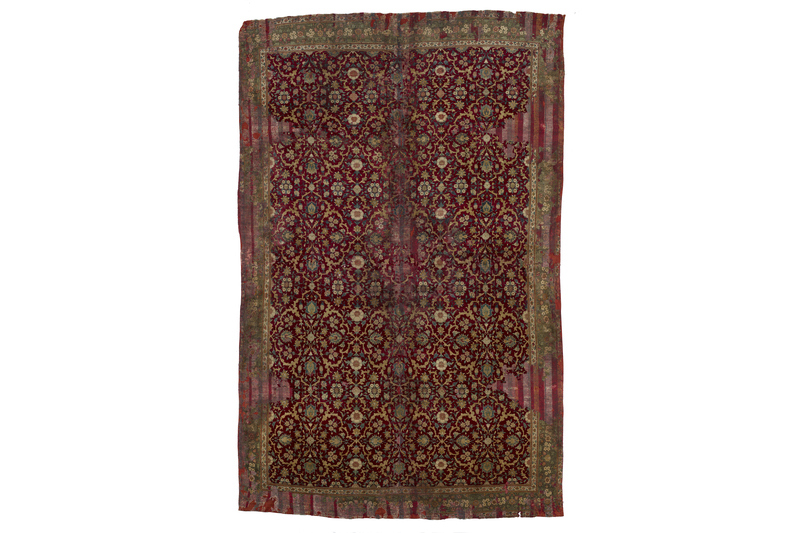 Carpet, India, Kashmir or Lahore, Mughal period, early 18th century. 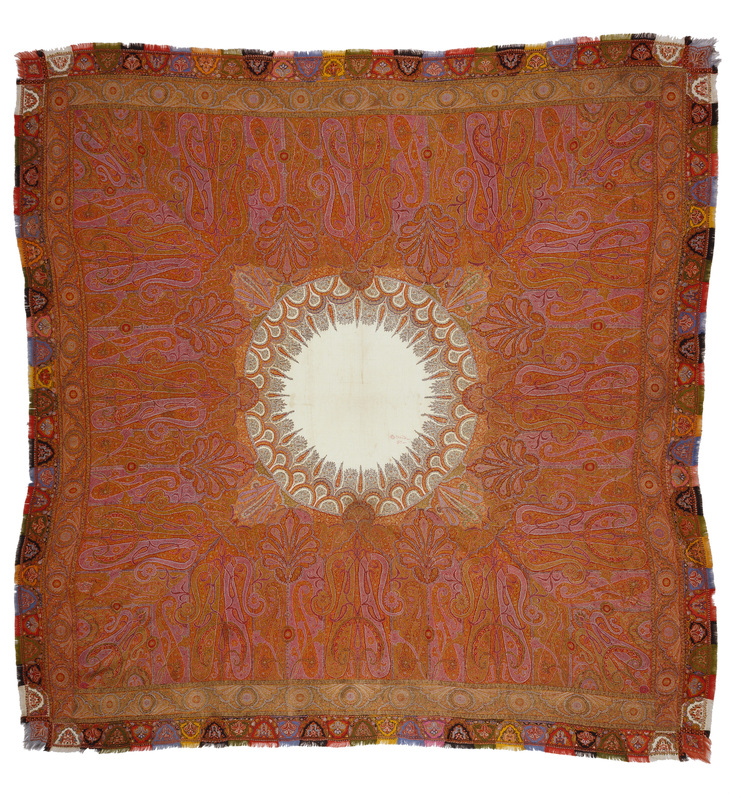 Pashmina, silk, 235 x 108 in. The Textile Museum R63.00.21. Acquired by George Hewitt Myers in 1945. 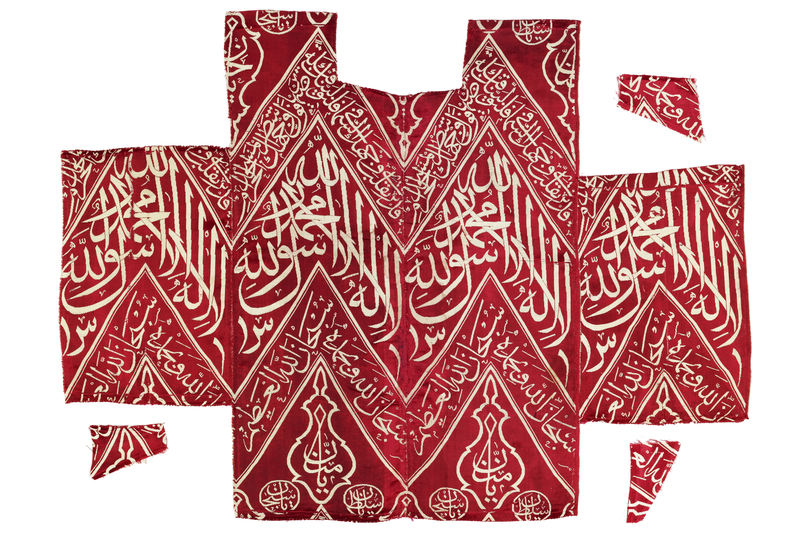 Fragments, probably used as a vest, Ottoman period, Turkey or Egypt, 18th century. Silk, 49 x 66 cm. The Textile Museum 3.158a. Acquired by George Hewitt Myers in 1930. Photo by Franko Khoury. 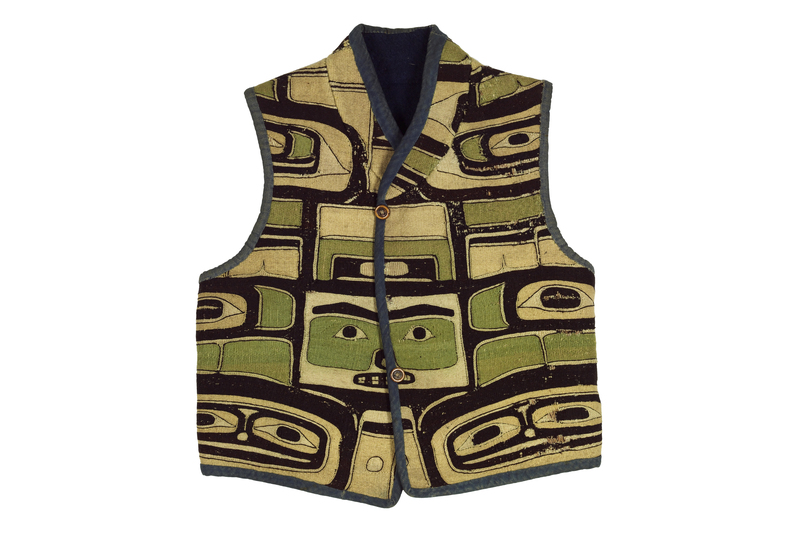 Vest made from a ceremonial mantle, Northwest coast of North America, Chilkat. Cedar bark, mountain goat hair, 54 x 48 cm. The Textile Museum 1963.53.1. Gift of Alan R. Sawyer. Photo by Renee Comet. 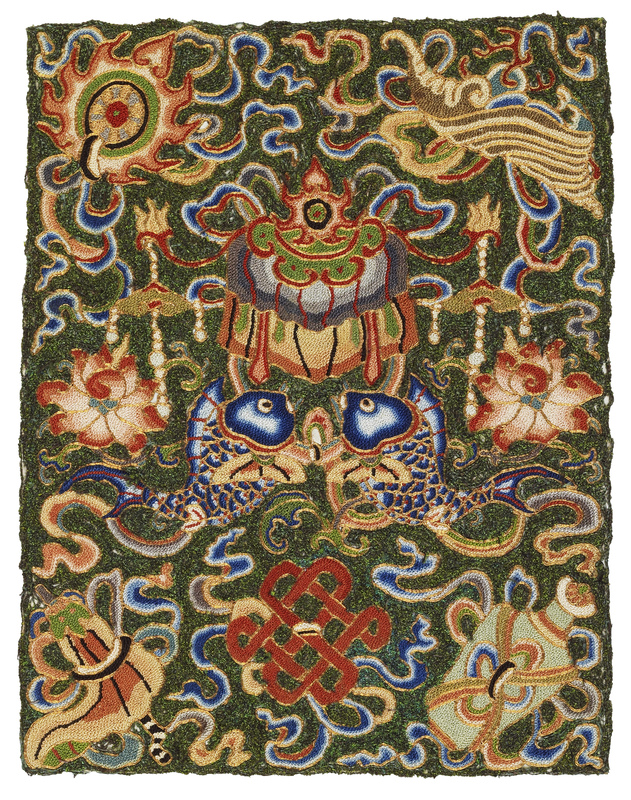 Hanging made from a dragon robe, China, 19th century. Silk, gold-wrapped yarns. The Textile Museum 2009.9.2. Gift of Elina Vesara Ostern Trust. 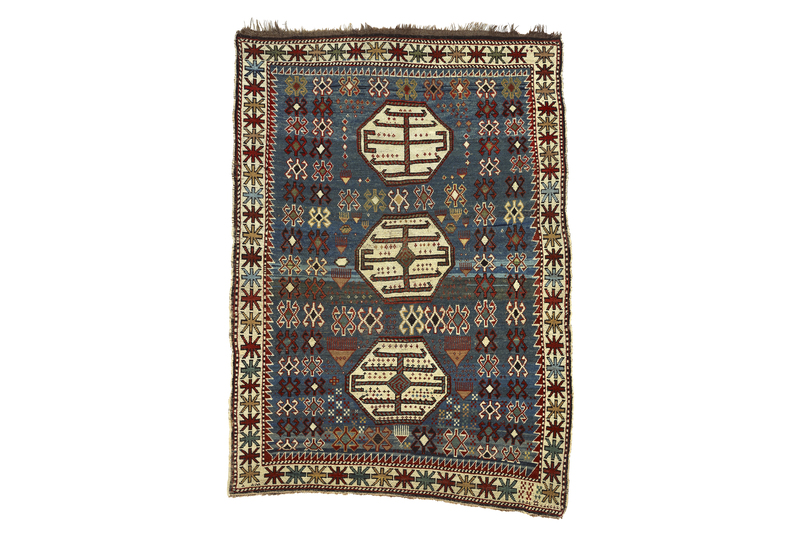 Hanging or cover, Central Asia, Afghanistan, 20th century. Cotton, wool, silk. The Textile Museum 1995.2.1. Gift of James W. Lankton. 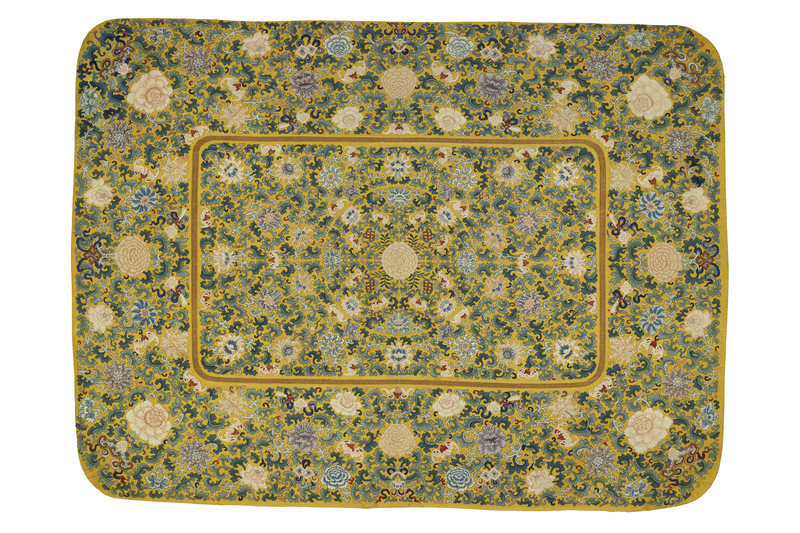 Cover, pieced from several textiles, Iran or India, 19th–20th century. Silk, metallic-wrapped yarns. The Textile Museum 1959.18.4. Gift of Mrs. Hoffman Philip. 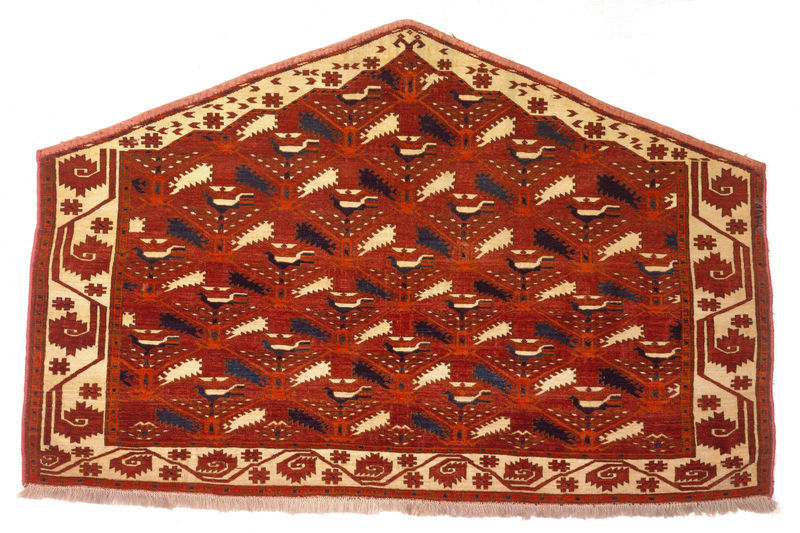 Panel, Central Asia, Uzbekistan, second half of the 19th century. Silk warp, cotton weft; warp-faced plain weave. The Textile Museum 2005.36.39. The Megalli Collection. 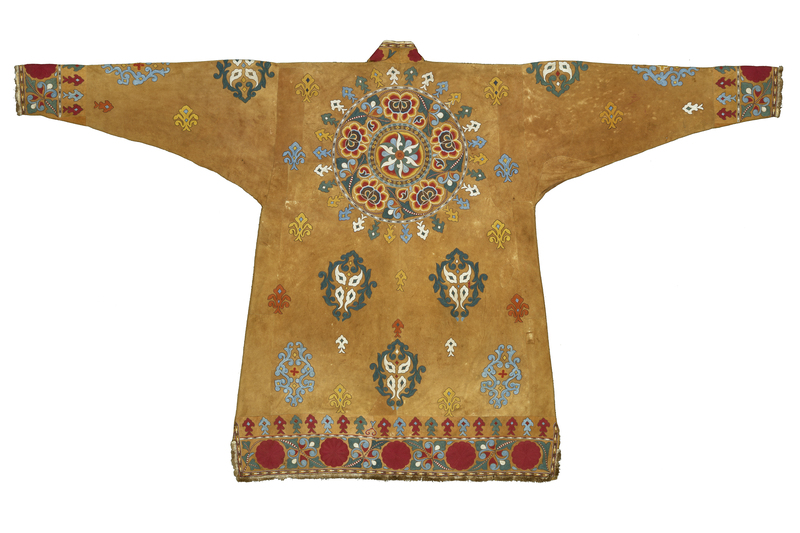 Woman’s robe (munisak) (back), Central Asia, Uzbekistan, Bukhara, first half 19th century. Silk, cotton. The Textile Museum TD1141.4. The Megalli Collection. 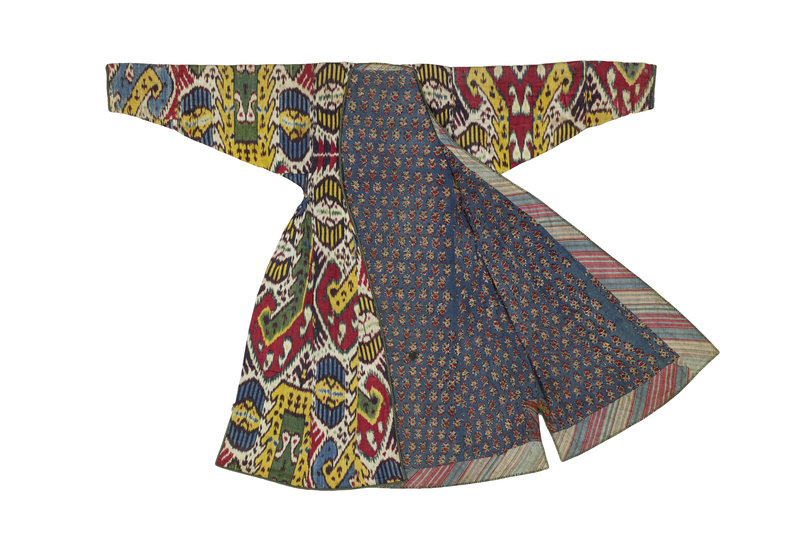 Woman’s robe (munisak) (front), Central Asia, Uzbekistan, Bukhara, first half 19th century. Silk, cotton. The Textile Museum TD1141.4. The Megalli Collection. Learn more about The Textile Museum's history and the vision of its founder, George Hewitt Myers.